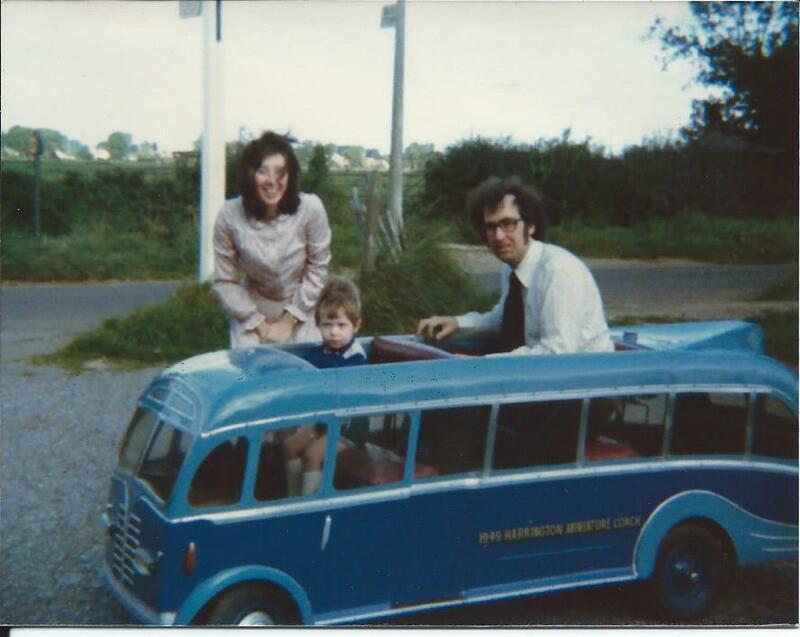 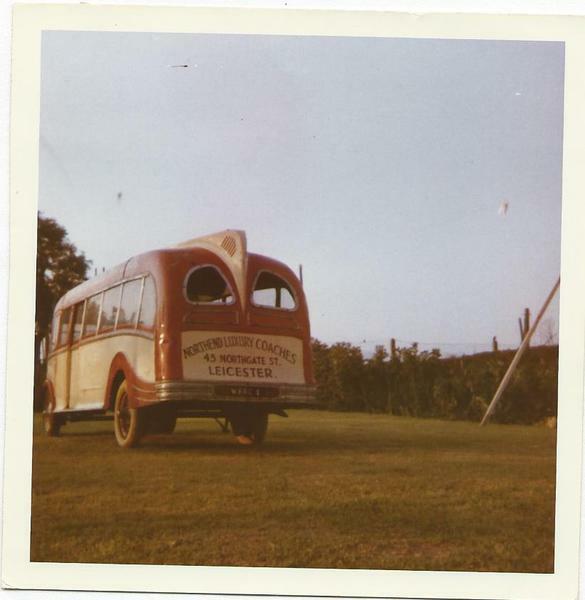 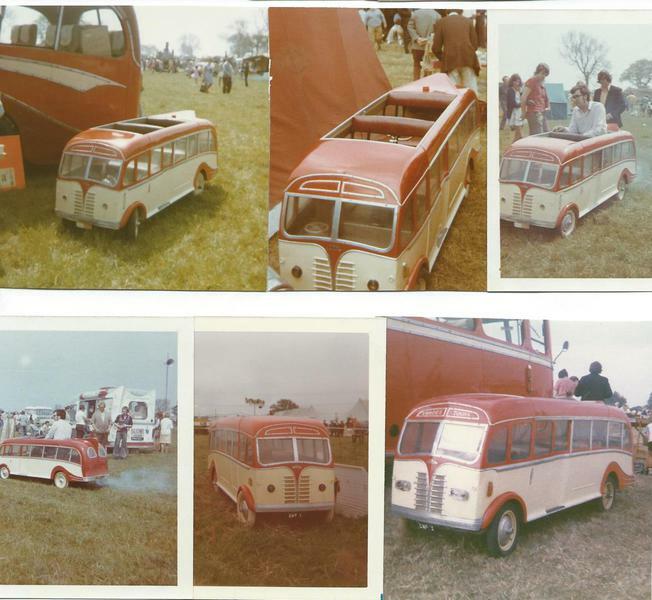 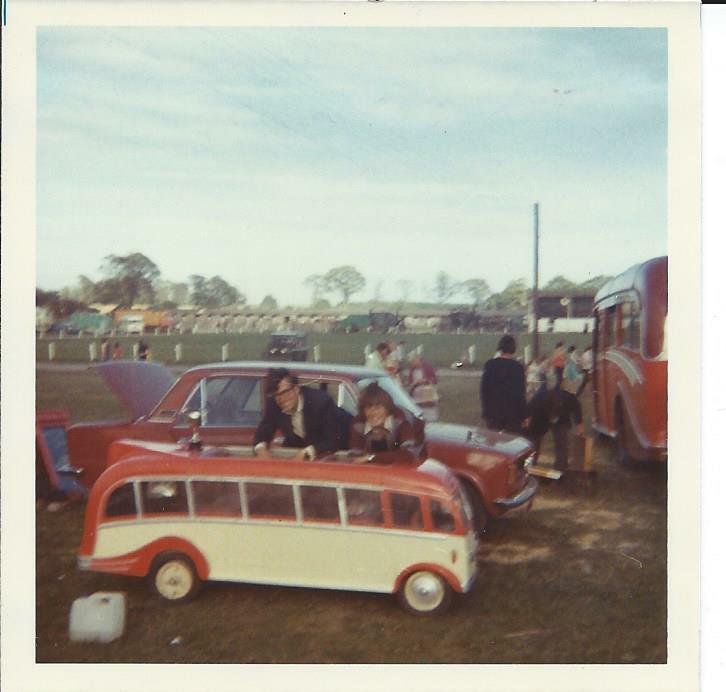 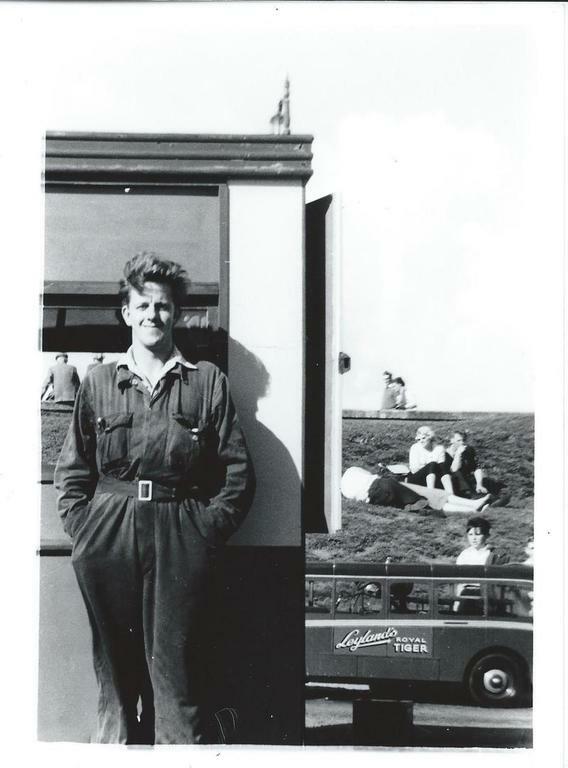 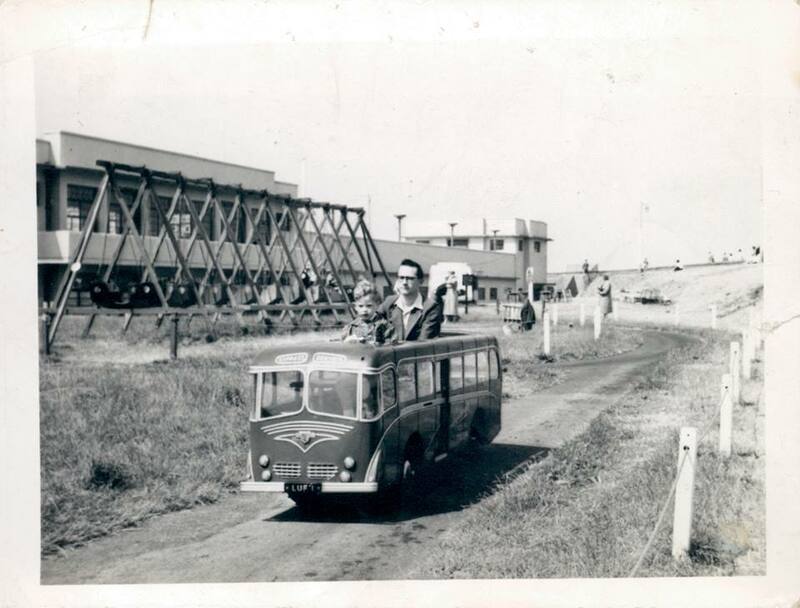 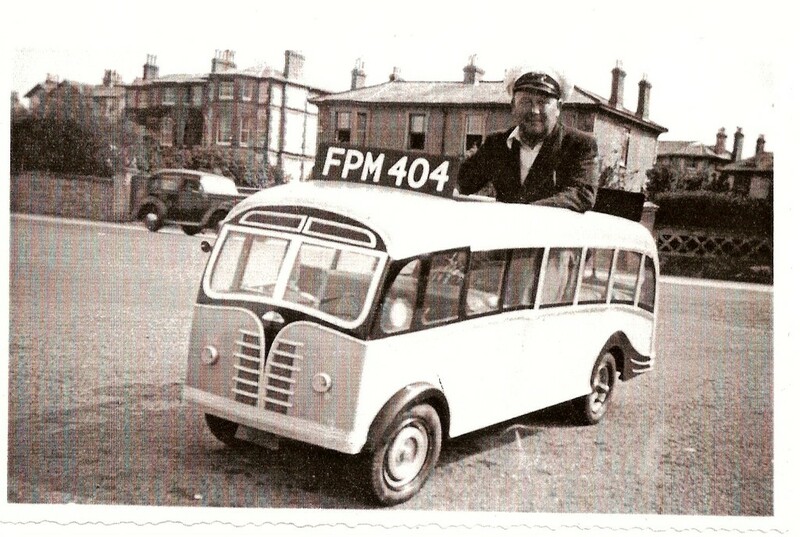 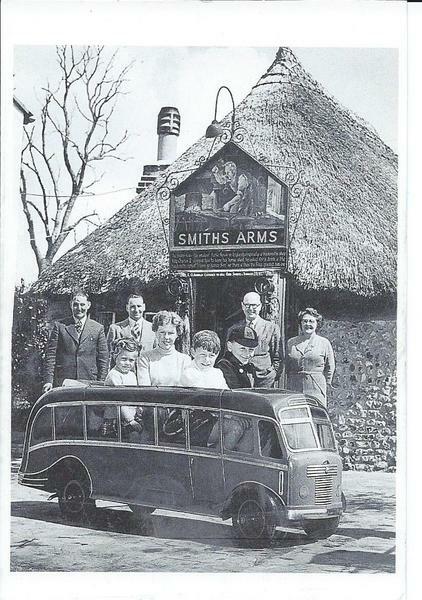 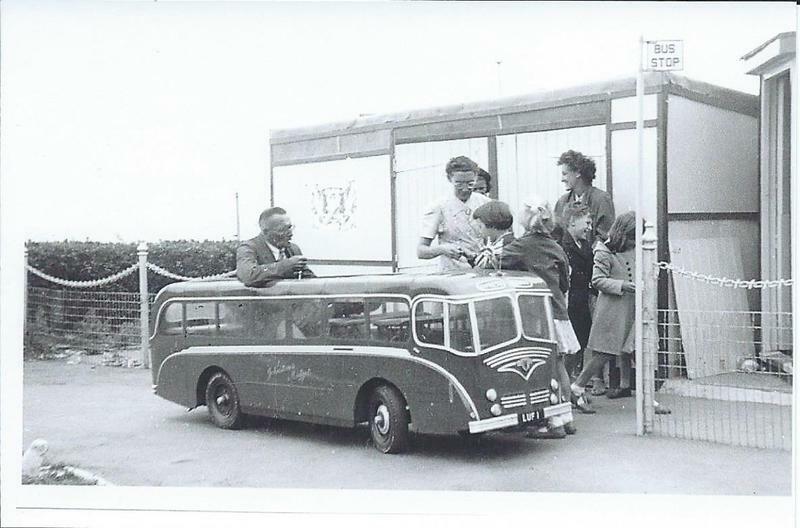 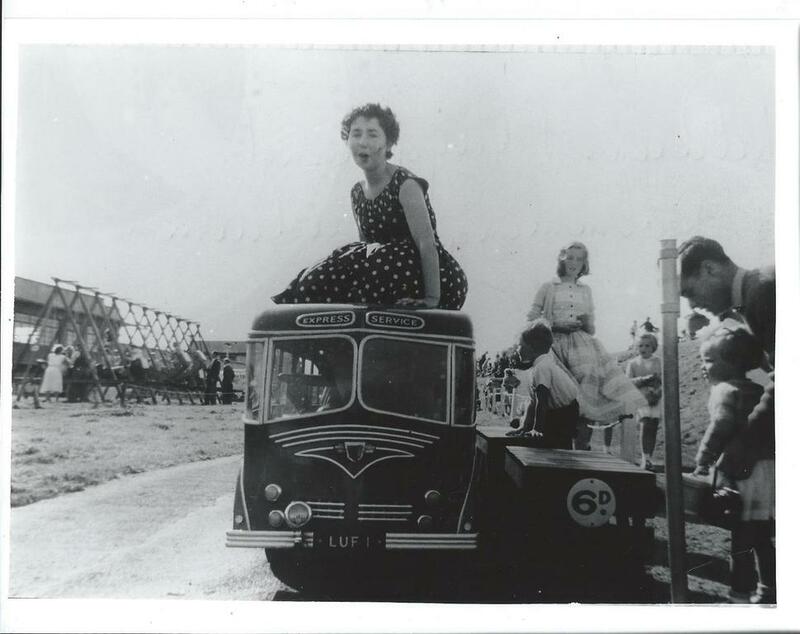 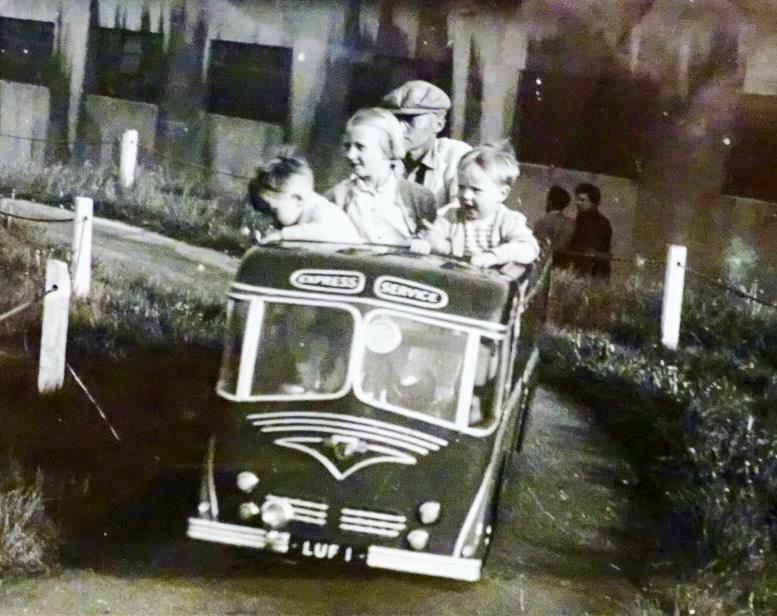 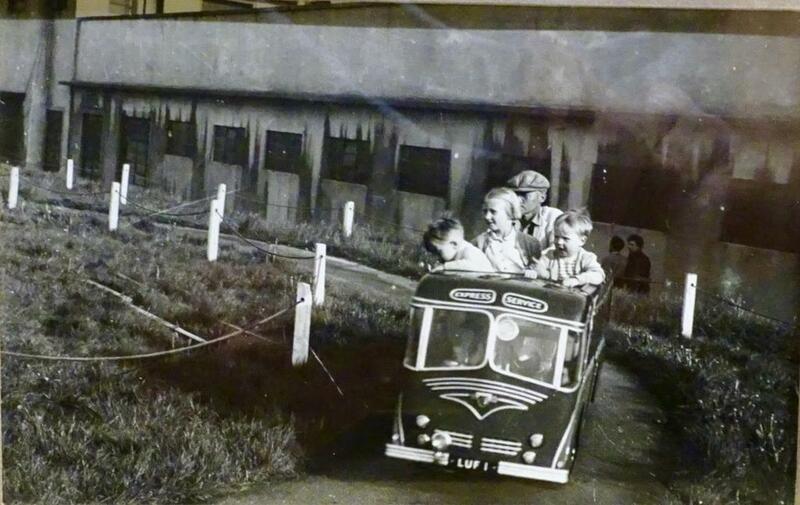 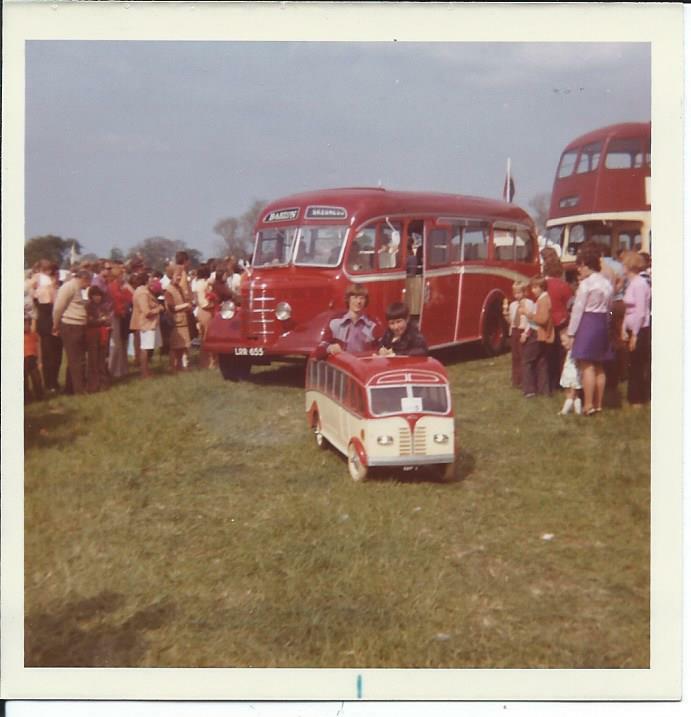 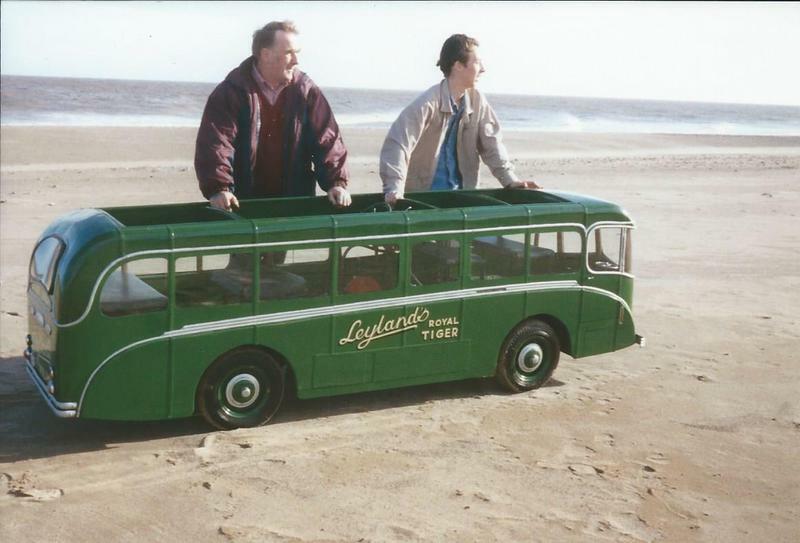 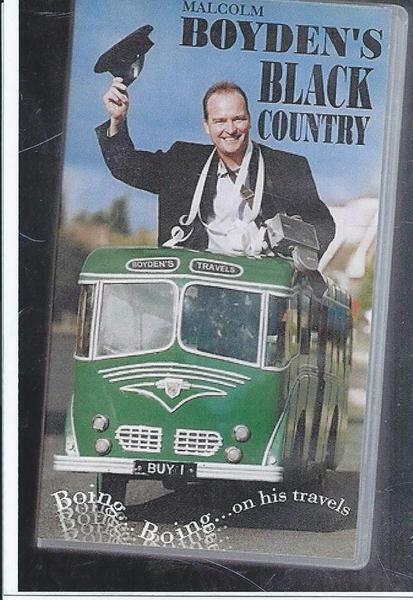 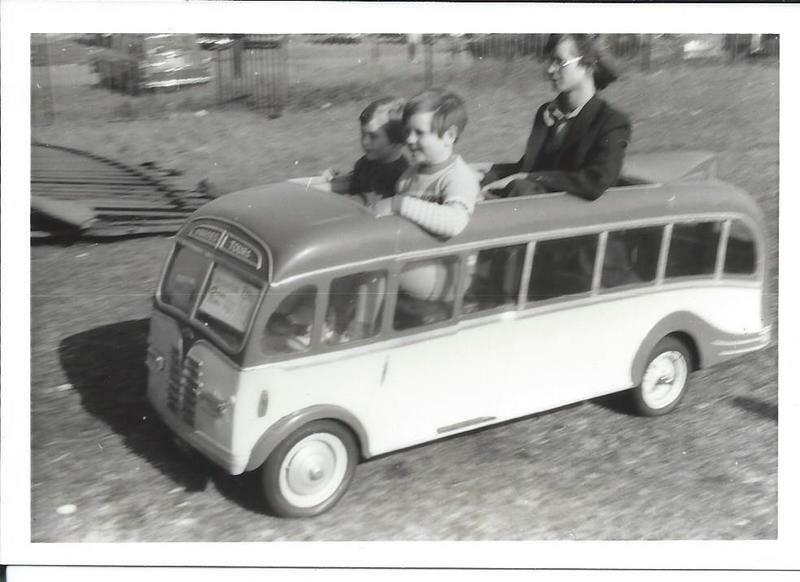 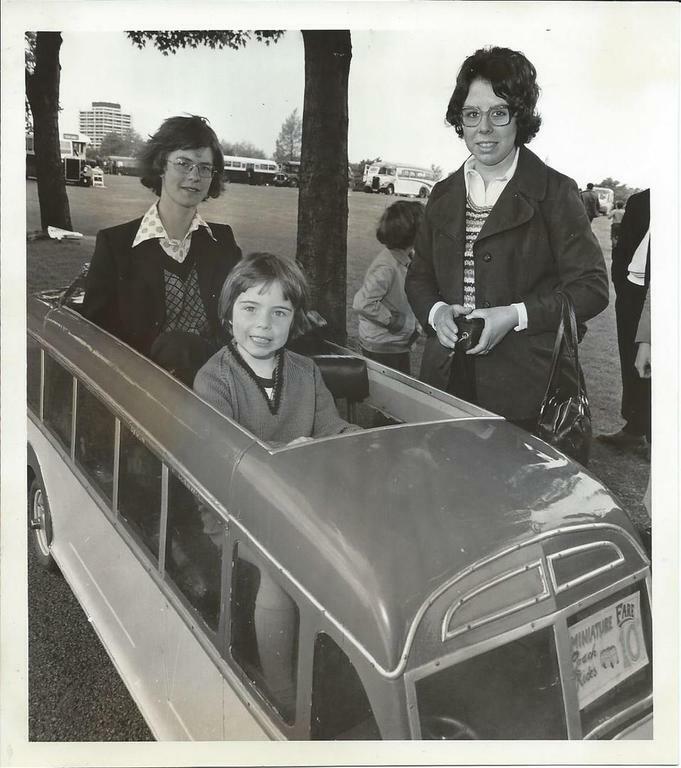 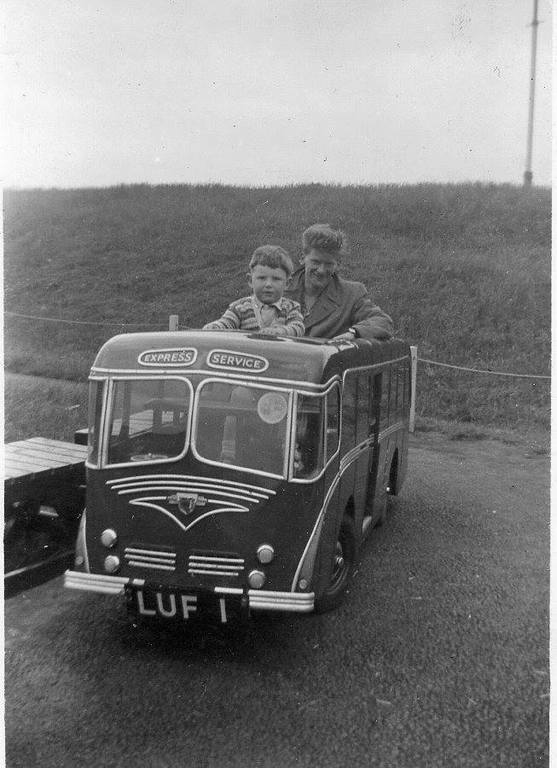 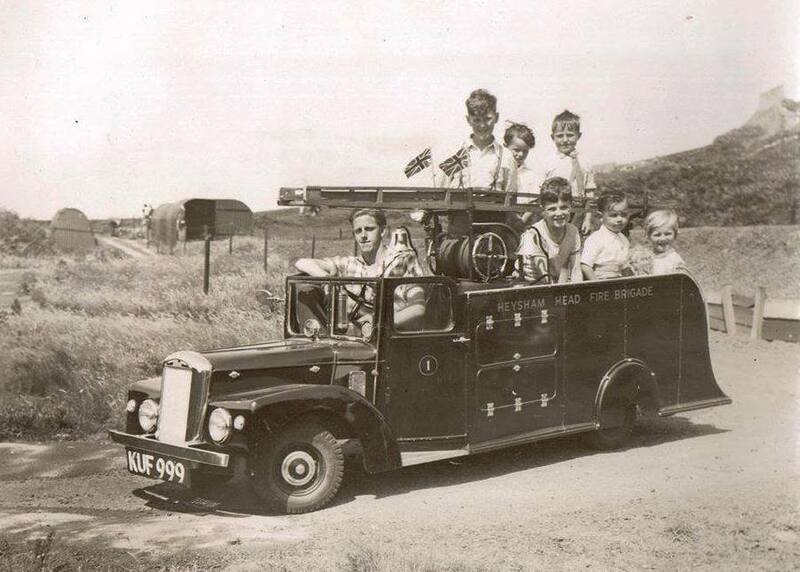 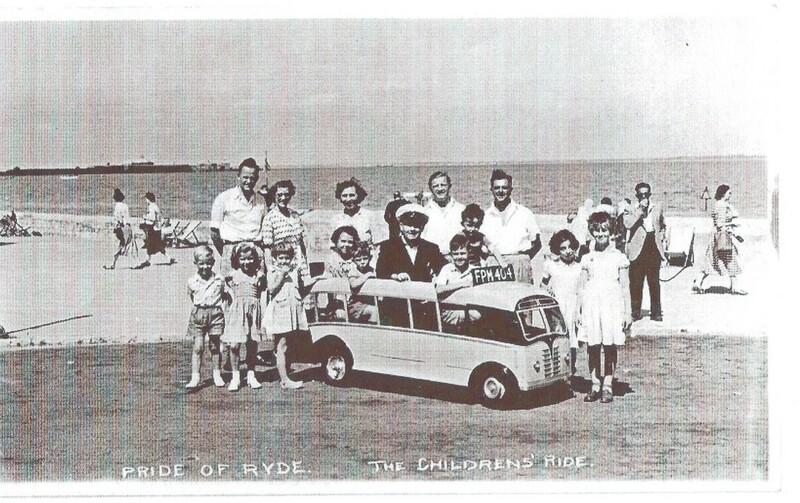 A trip to the seaside during the 1950’s and early 1960’s as a young boy with my parents has vivid memories of the small coaches that were produced in Brighton by Ernie Johnstone. 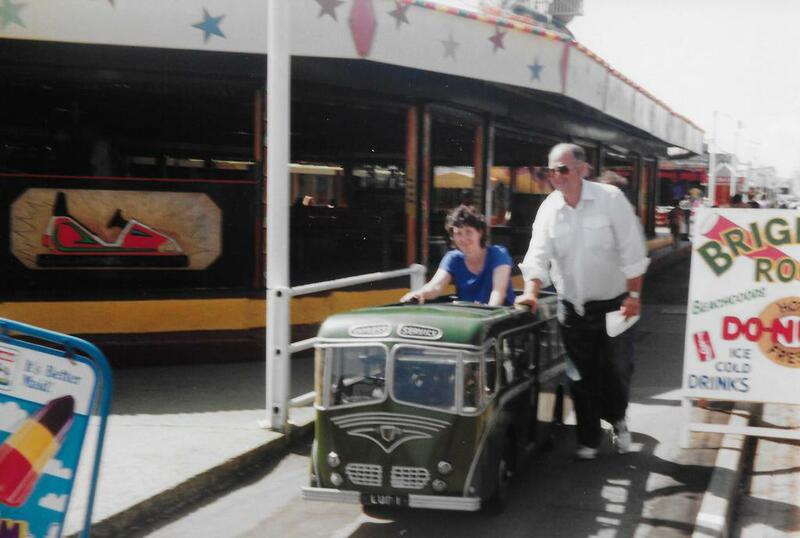 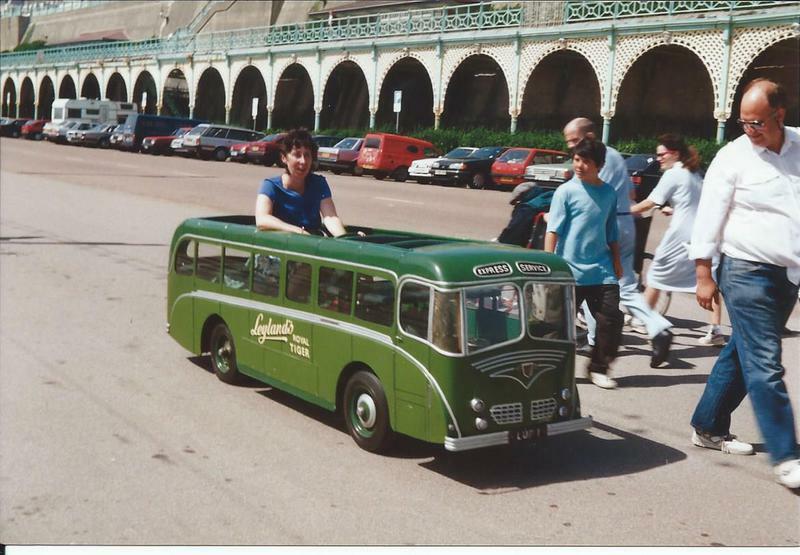 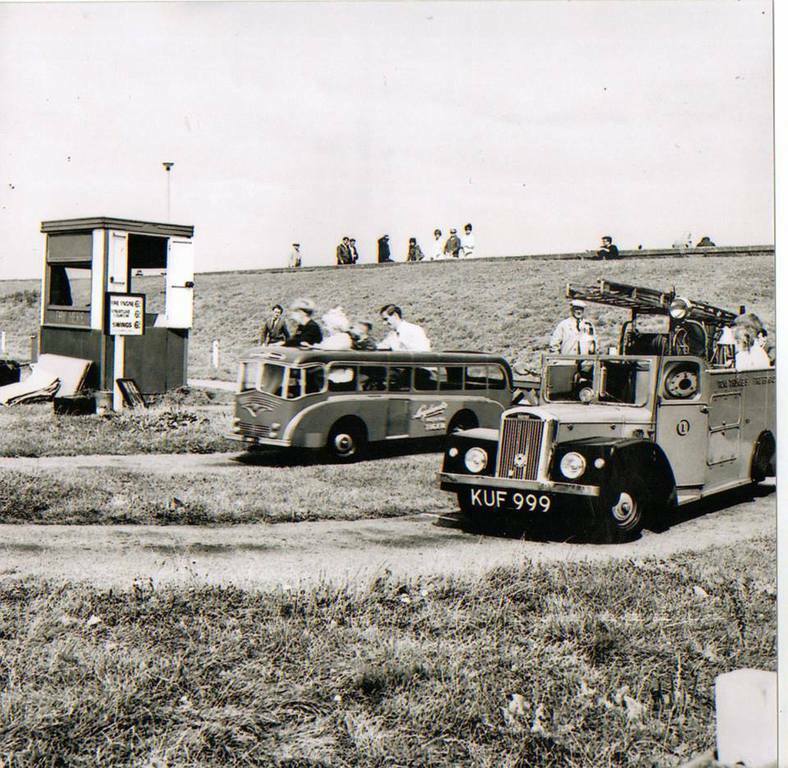 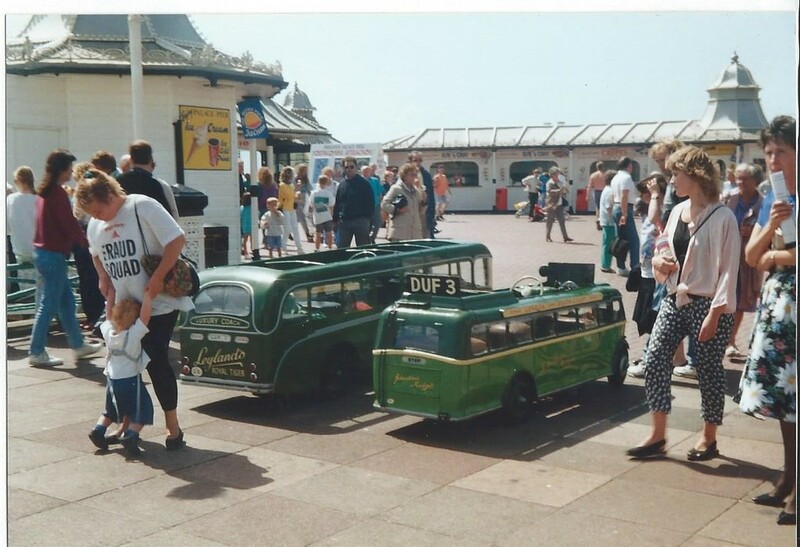 The little bus on Great Yarmouth seafront, two coaches in Arbroath, Scotland (next to a Miniature Railway), visiting Margate in Kent where in Dreamland another small bus was running and with holidays to Brighton, who cannot forget the sight of Peter Pan’s Playground. 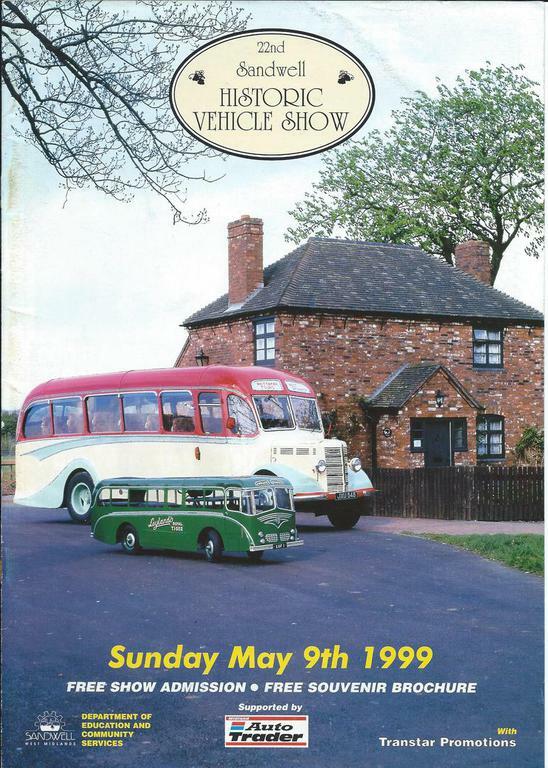 The biggest impact however was passing a coach operators garage on the bus ride from my home in Swithland to Leicester when under this railway bridge stood a small coach advertising coach trips for Northend Motors and Coaches. 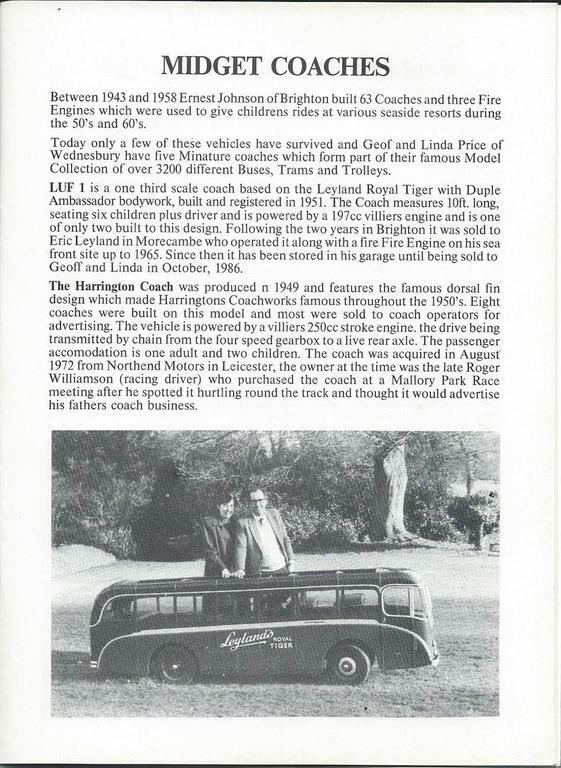 This was to start an interest that carries on today. 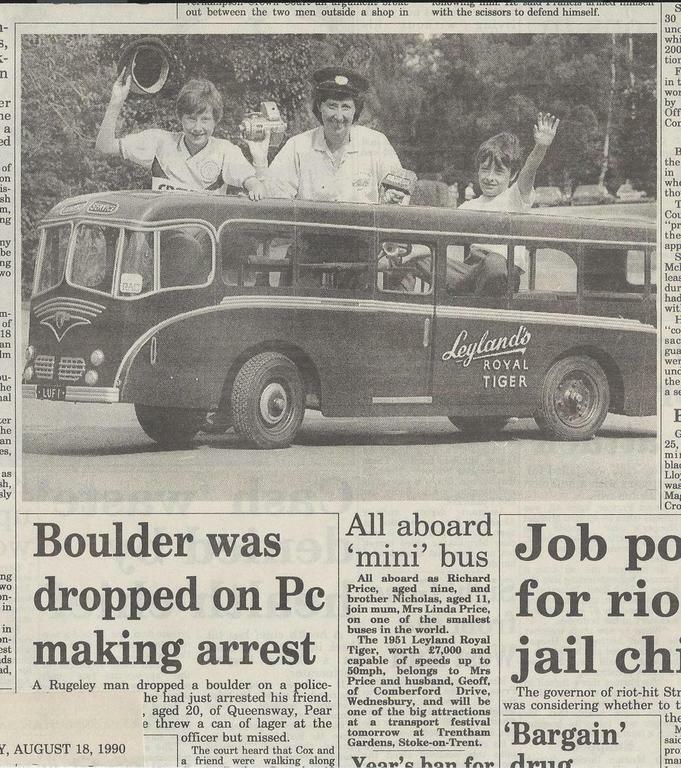 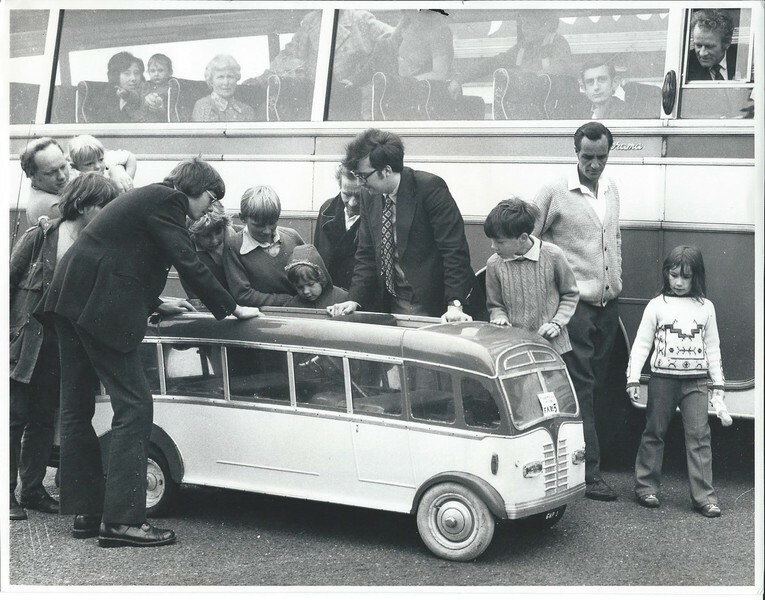 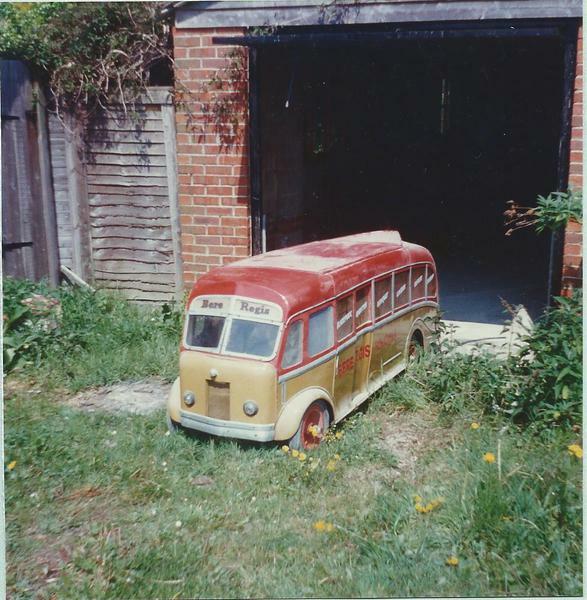 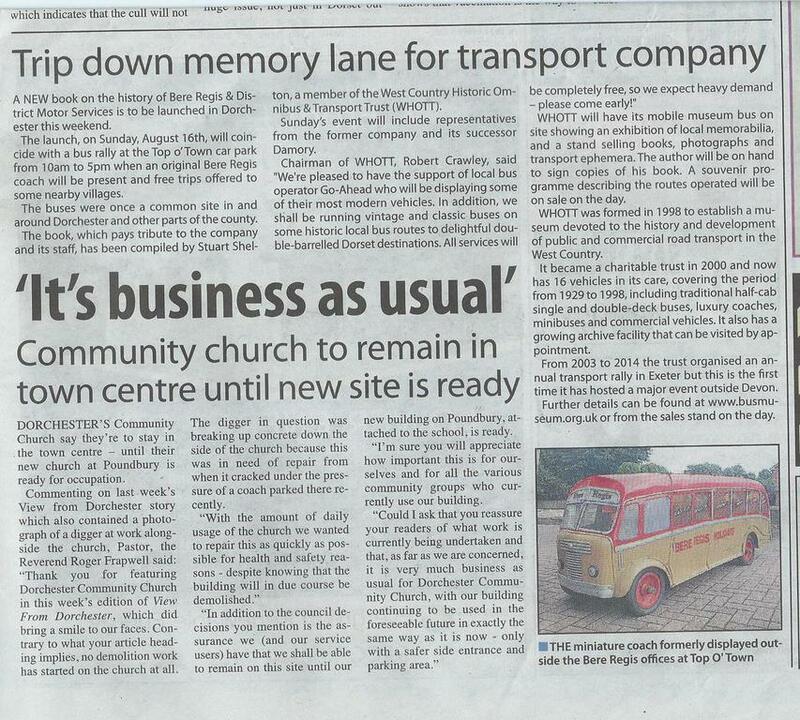 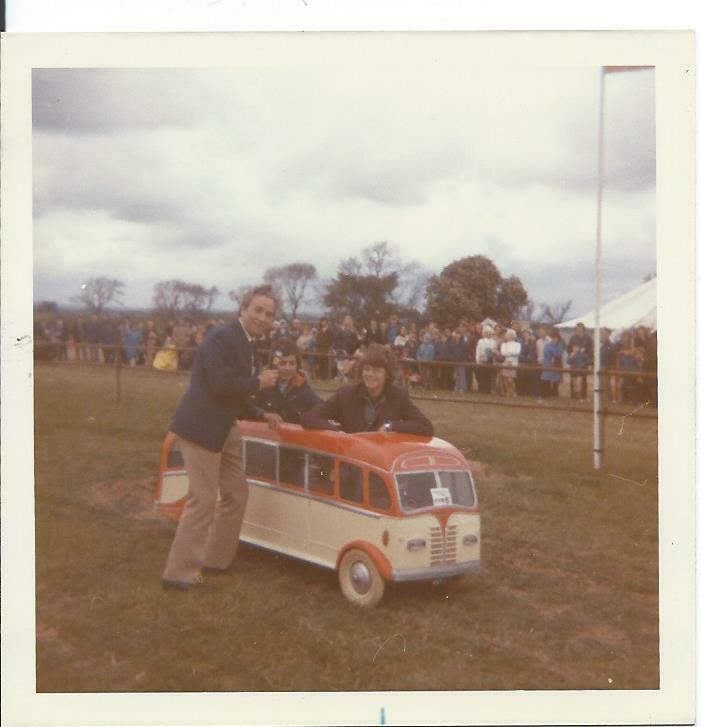 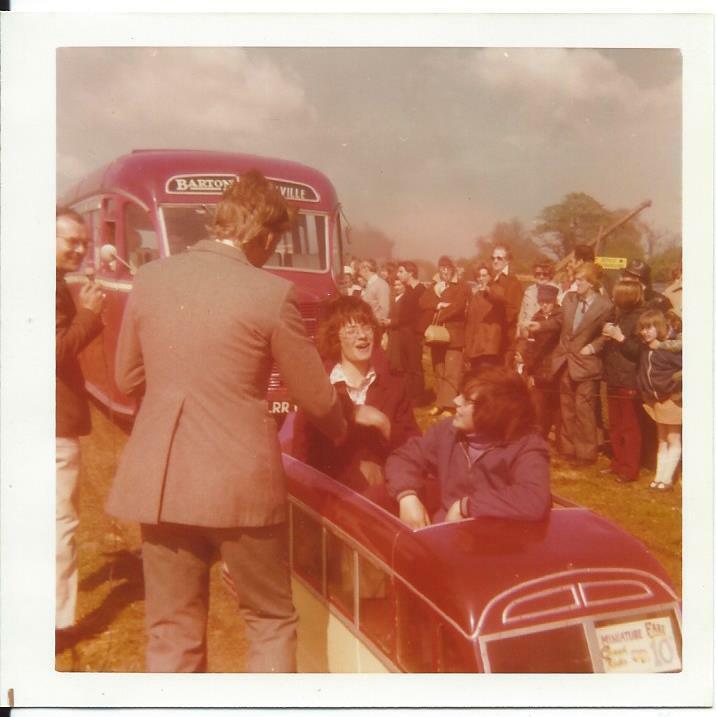 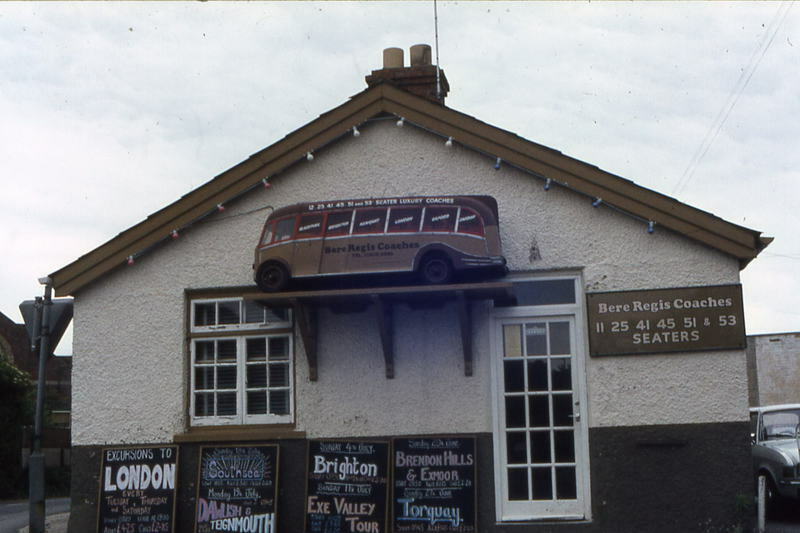 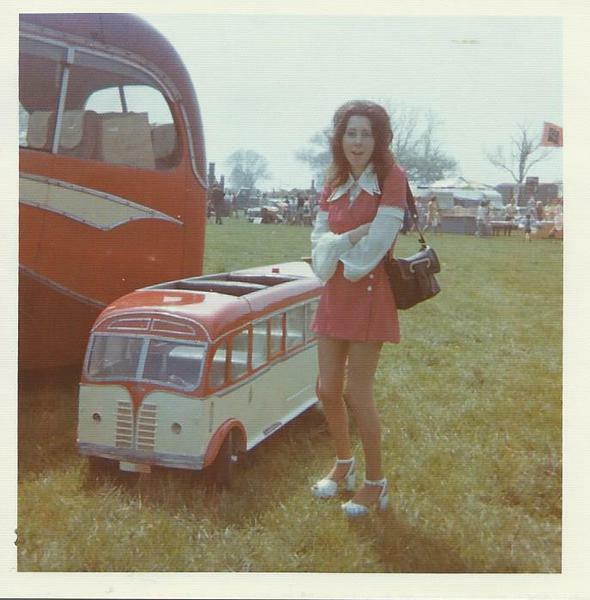 In June 1972 Geoff was talking about this little bus with Linda and decided to call in on the Coach Company to find out where it had gone and surprisingly was told by the owner of the Company, Dodge Williamson, it was in the rear of the garage under a load of rubbish – but if I spoke to his son (famous racing driver Roger Williamson who had purchased the coach whilst spotting it being driven the Mallory Park Race Circuit in 1960) I could possibly buy it from him. 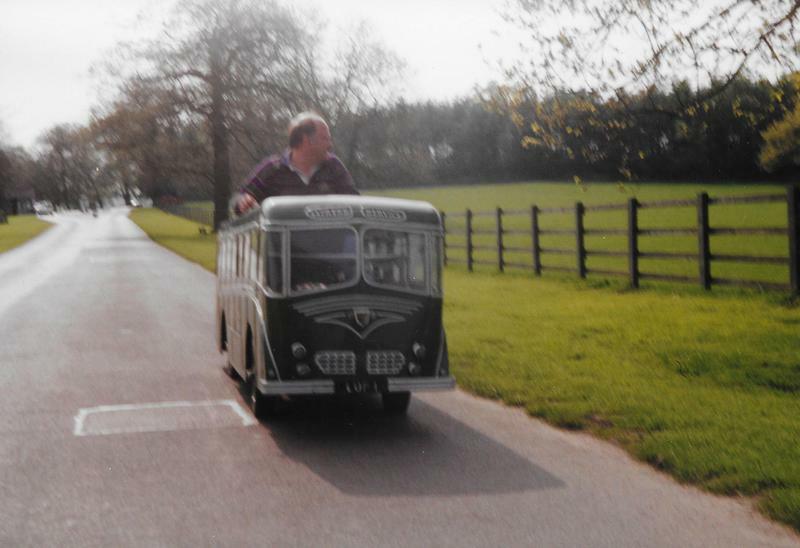 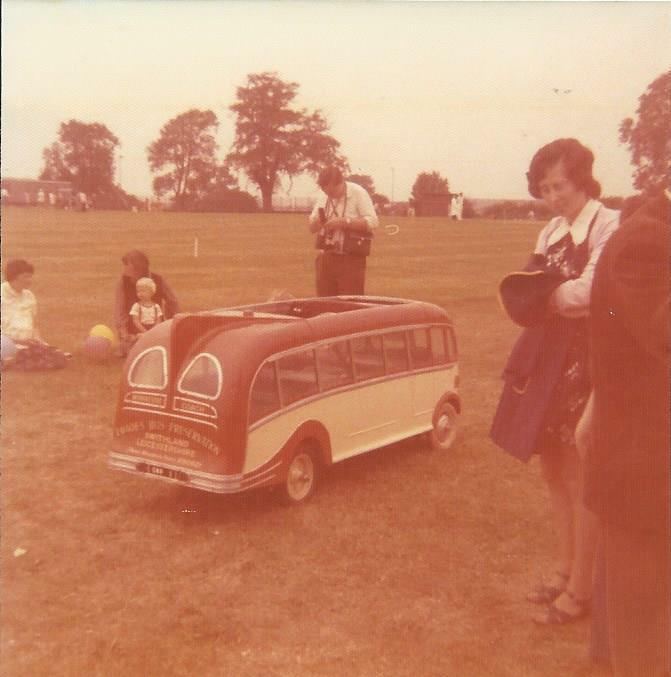 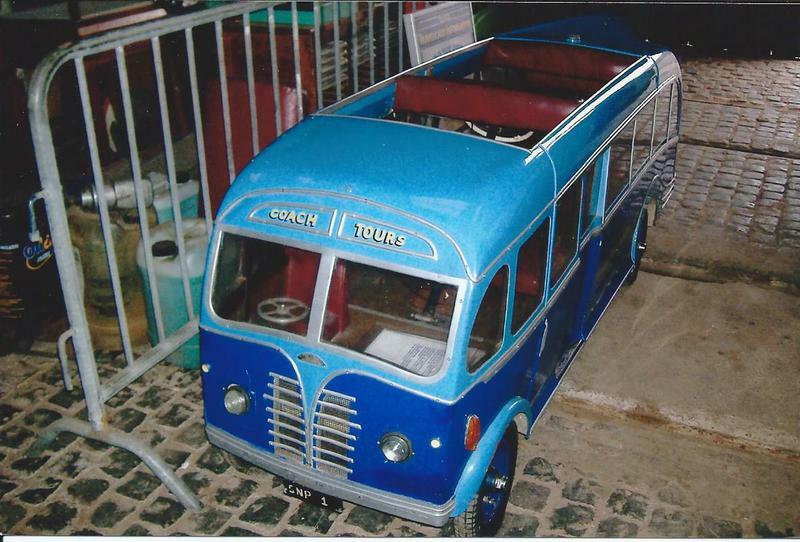 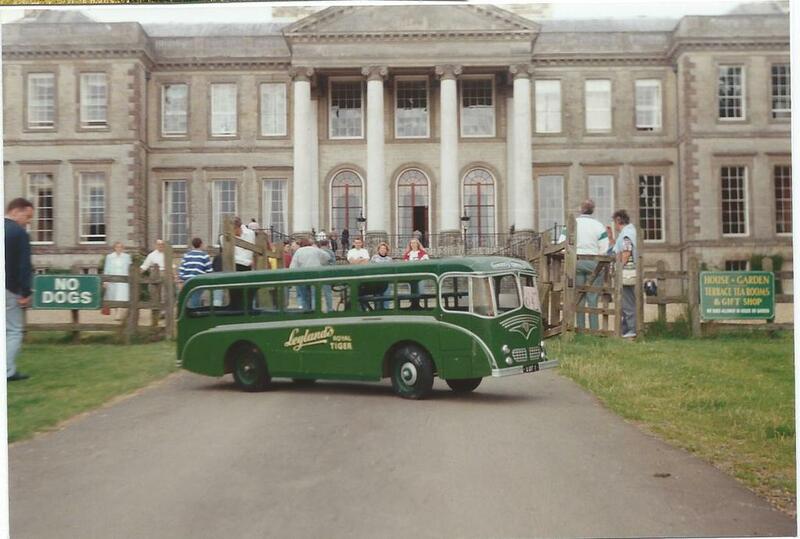 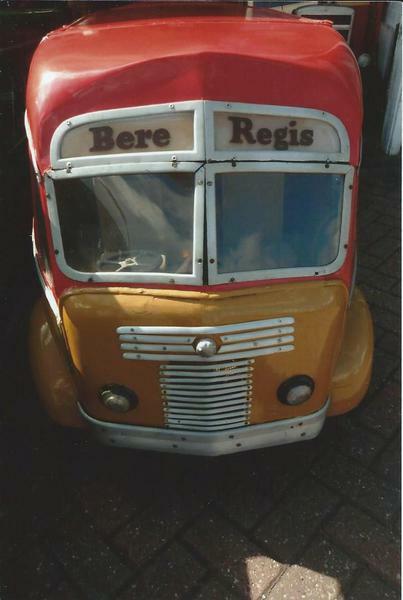 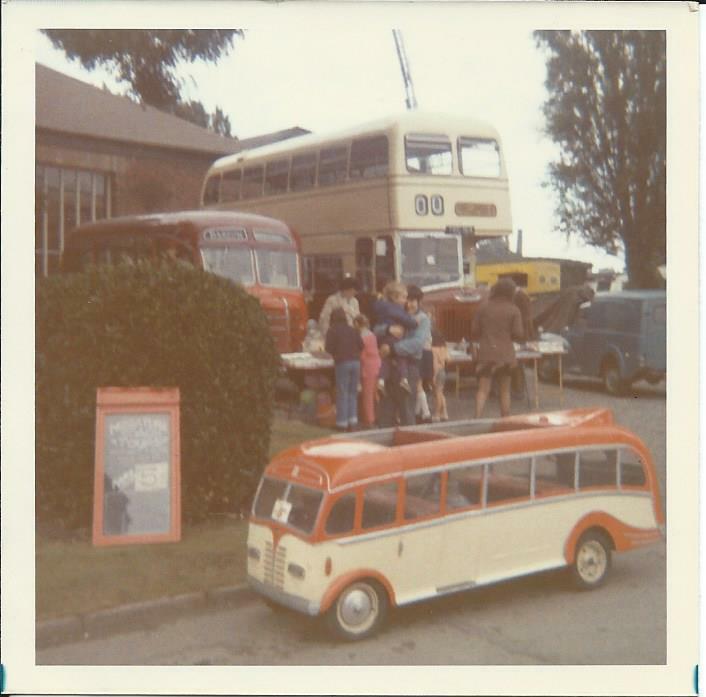 A visit was therefore made to Roger Williamson’s home and for a cost of £85 this coach was acquired on the 21st July 1972, fully restored in Northend Motors Coach Company livery and used at many transport rallies for children’s rides between 1975 and 1990. 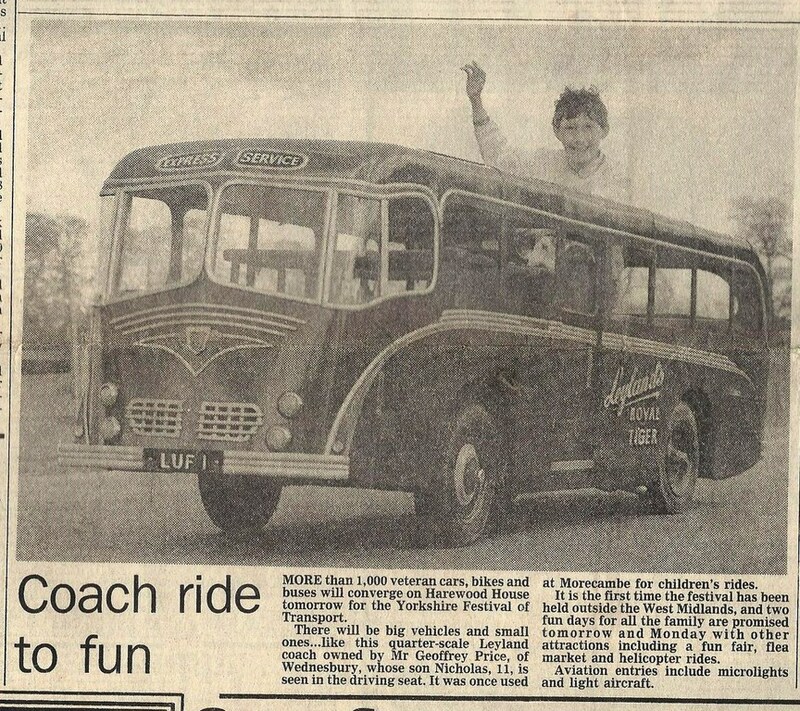 The coach was again restored in 1980. 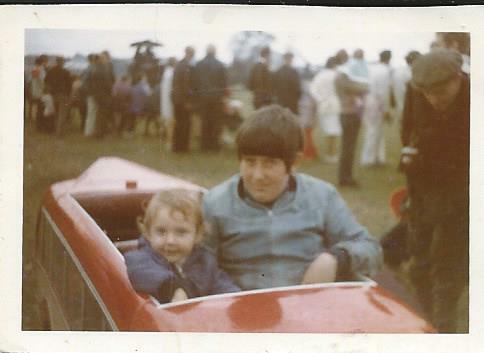 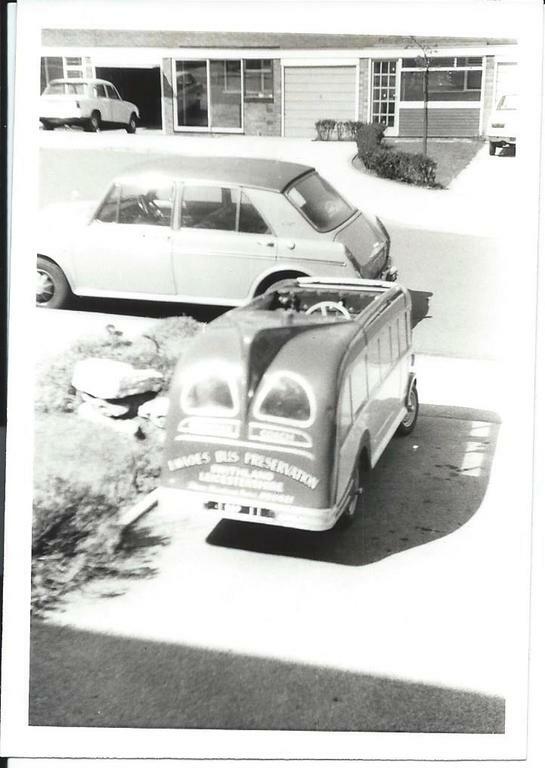 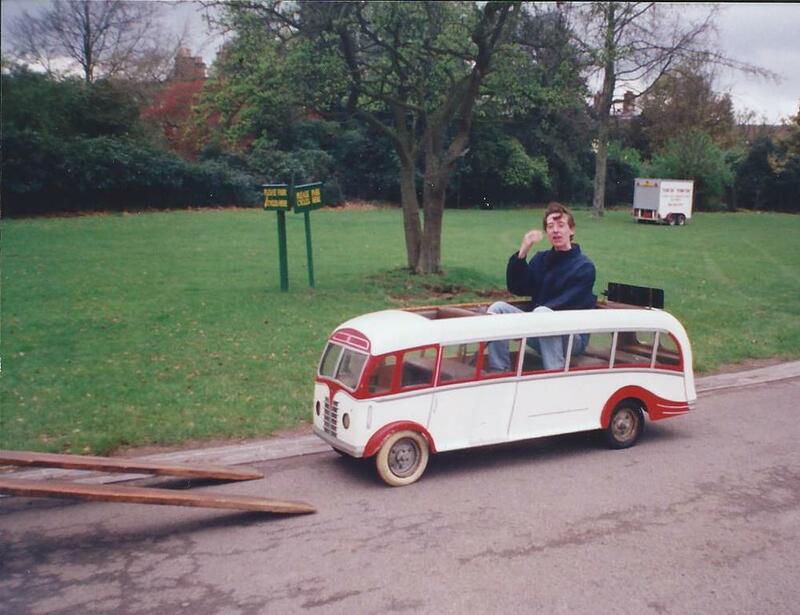 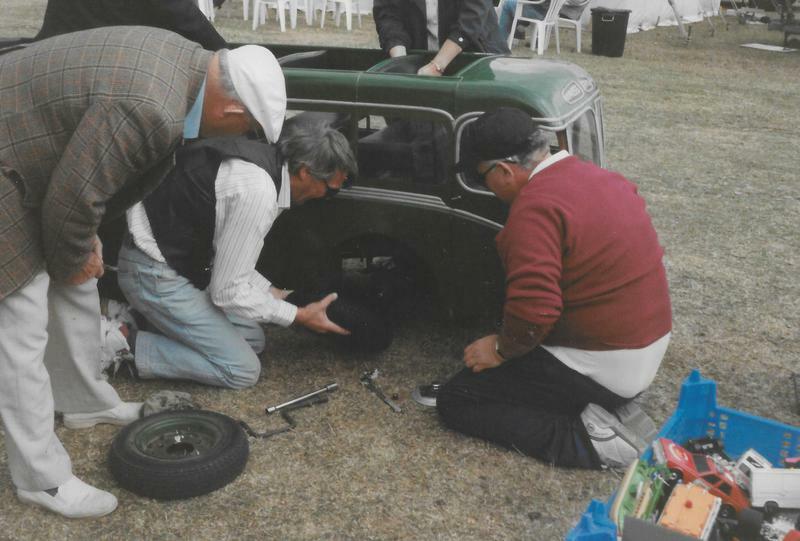 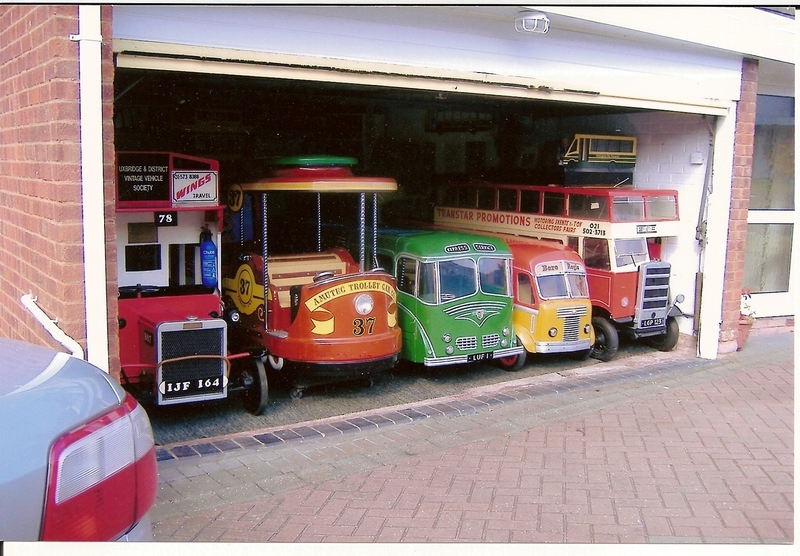 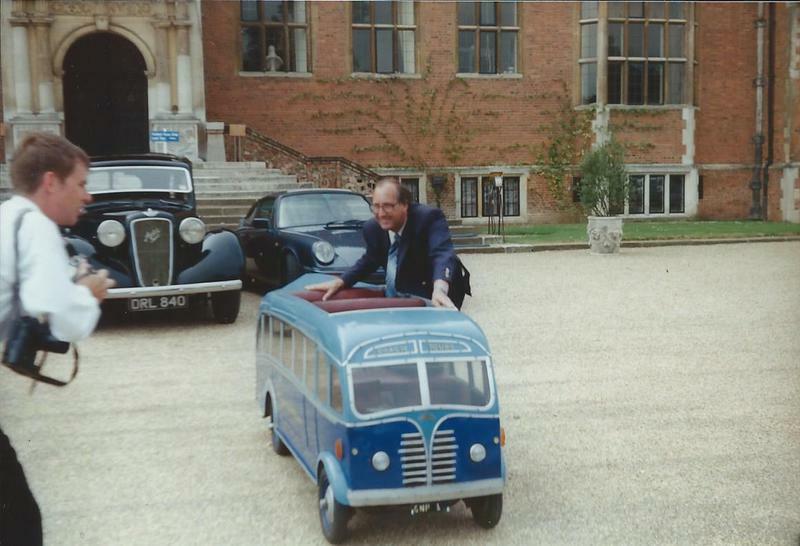 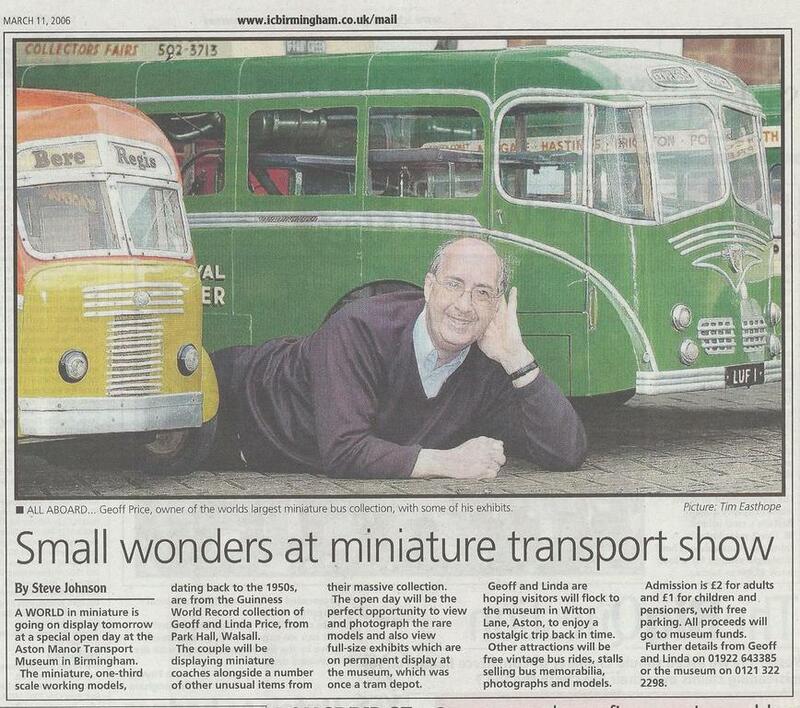 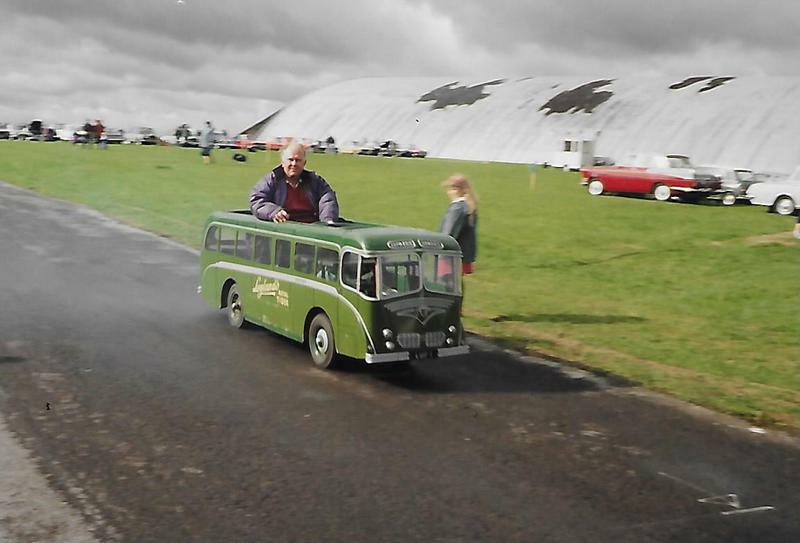 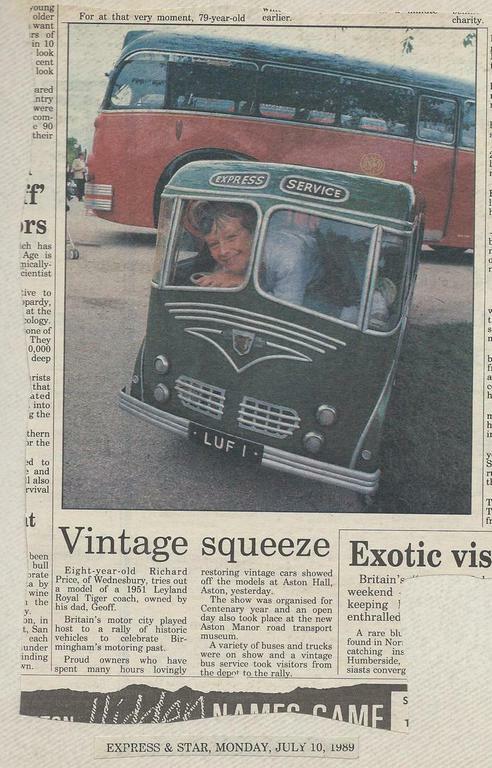 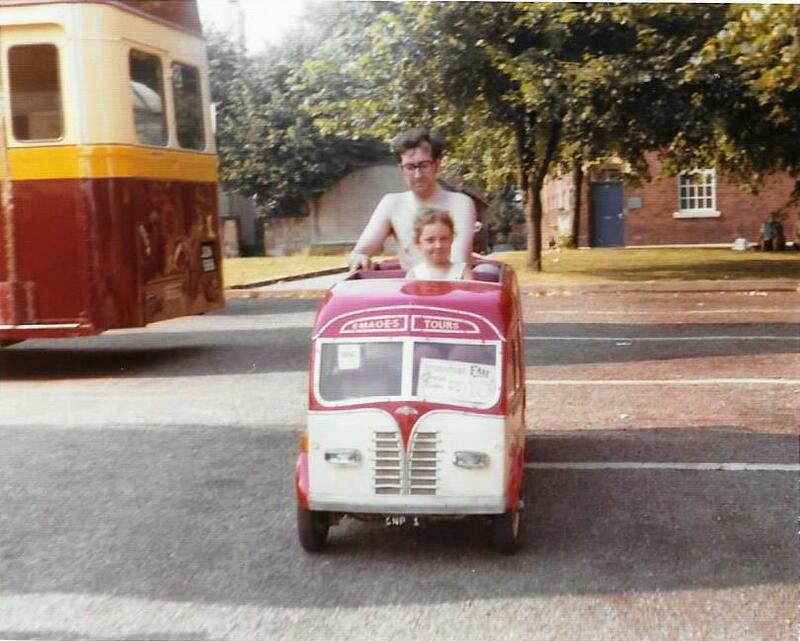 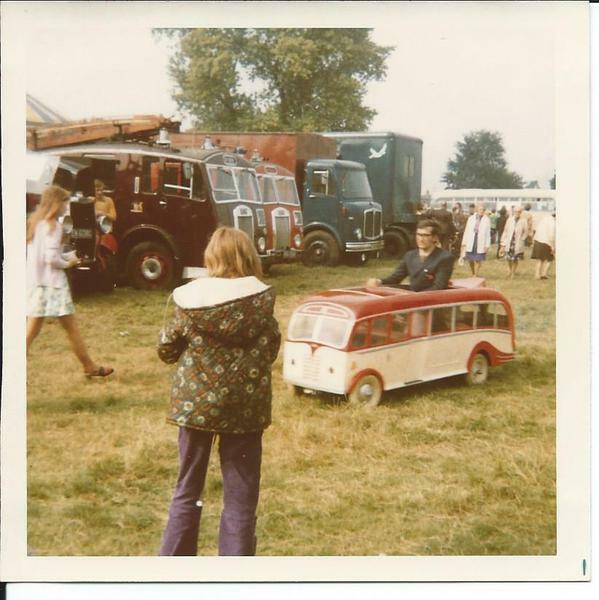 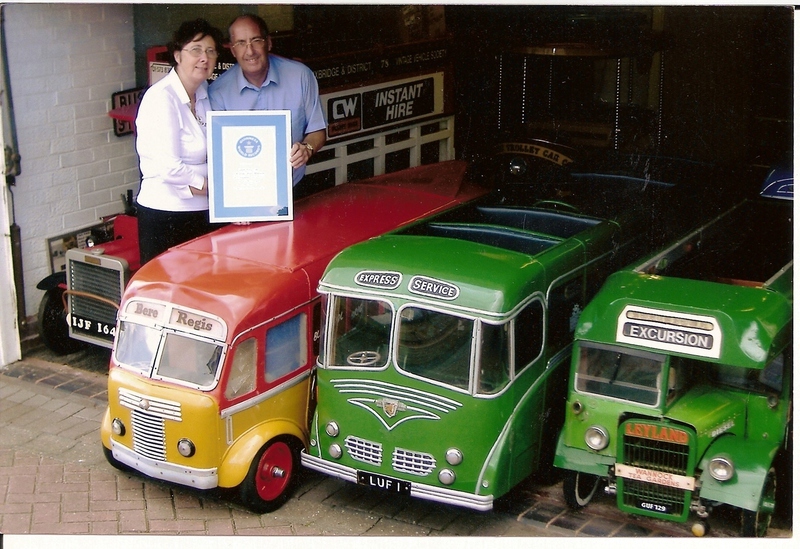 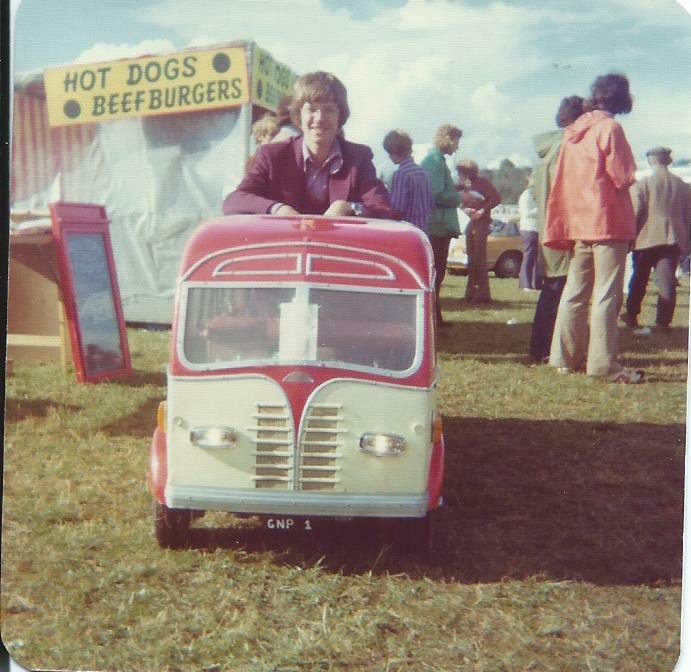 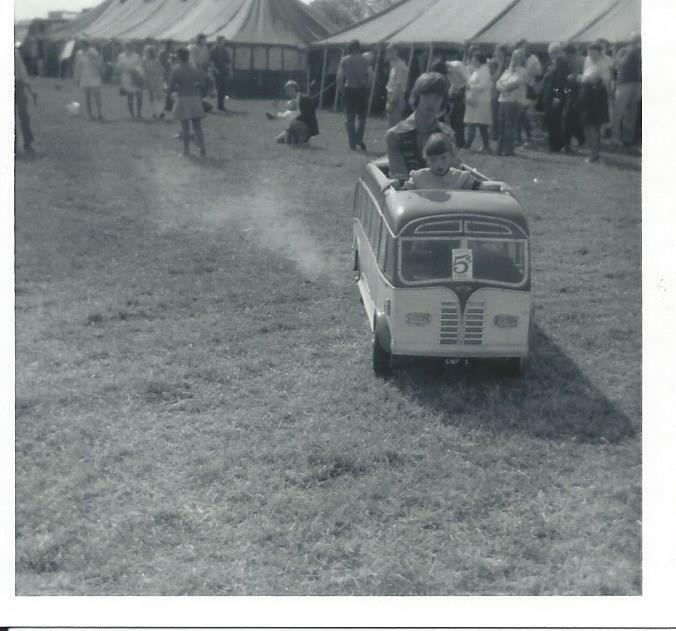 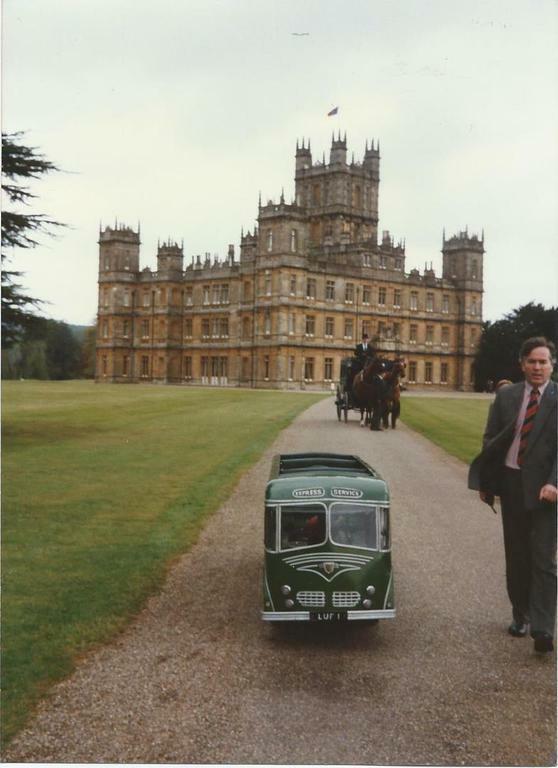 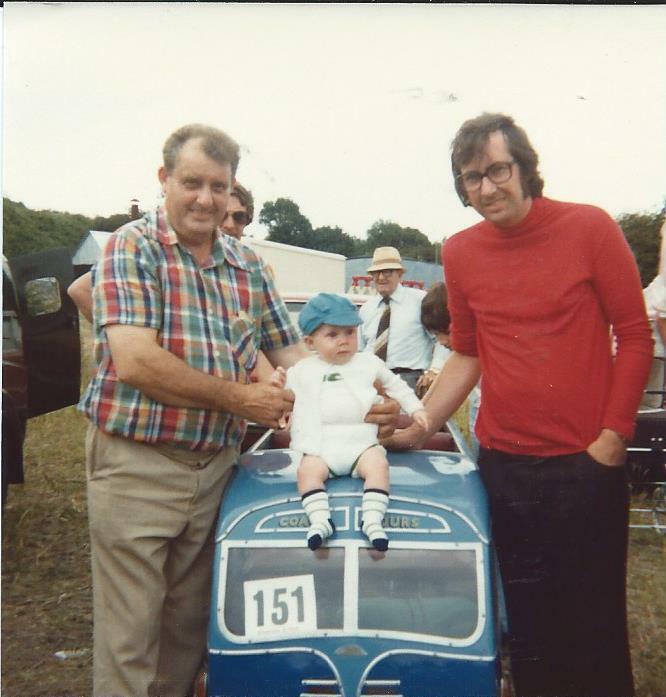 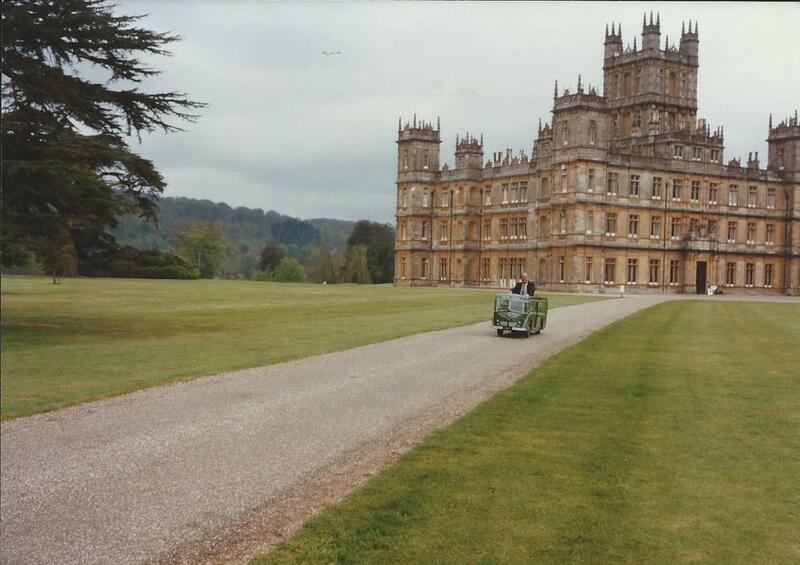 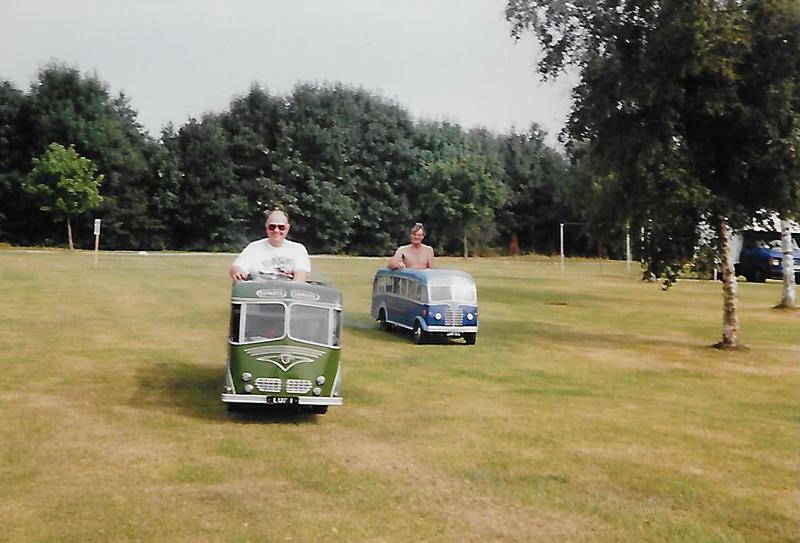 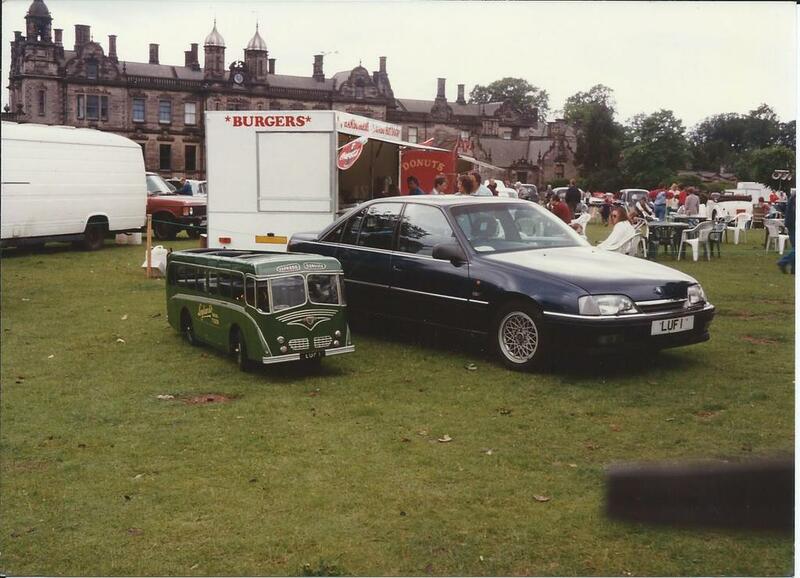 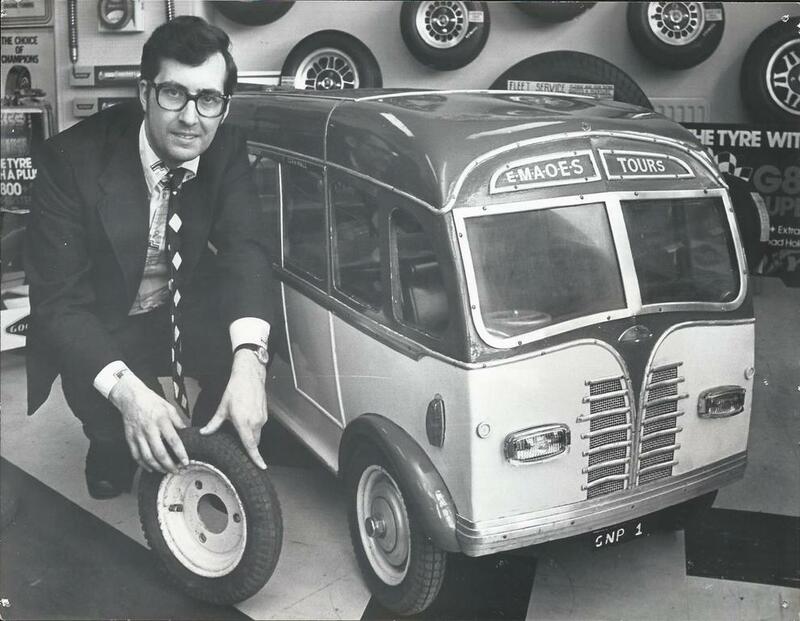 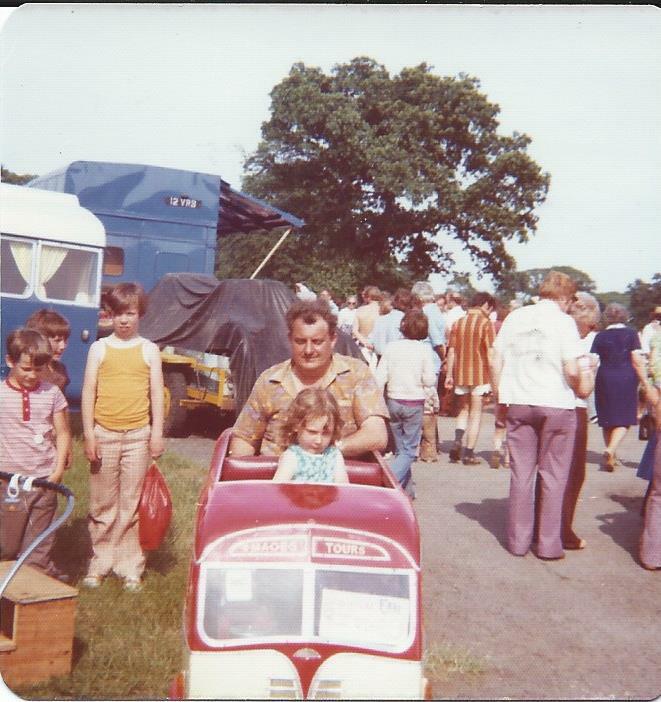 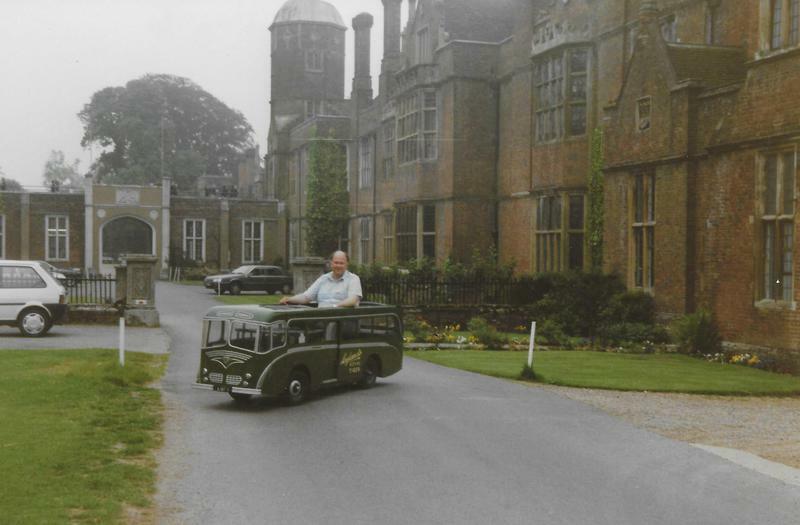 Since this time Geoff has continued to research the history of these small vehicles and also added a number of them over the years to his personal collection. 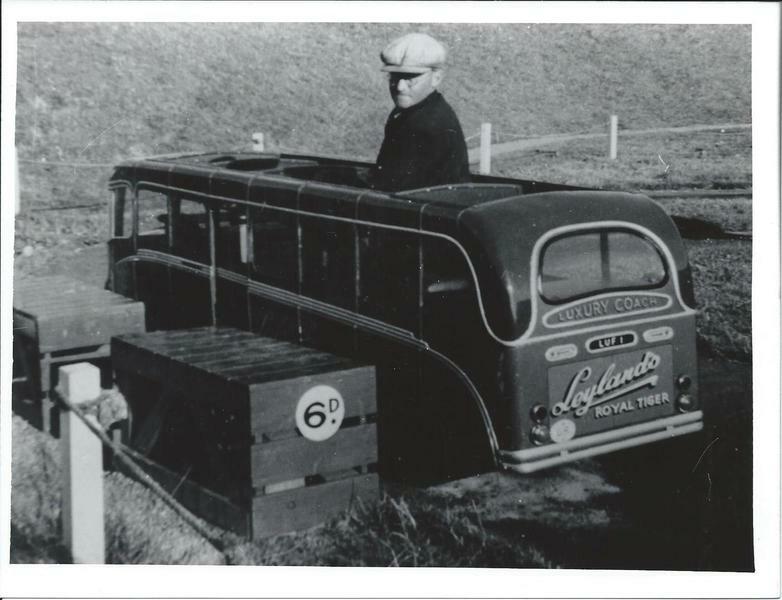 The history of these coaches goes back to 1935 when Ernie Johnstone built his first miniature coach which was pedal powered and a replica of the Southdown TS2. 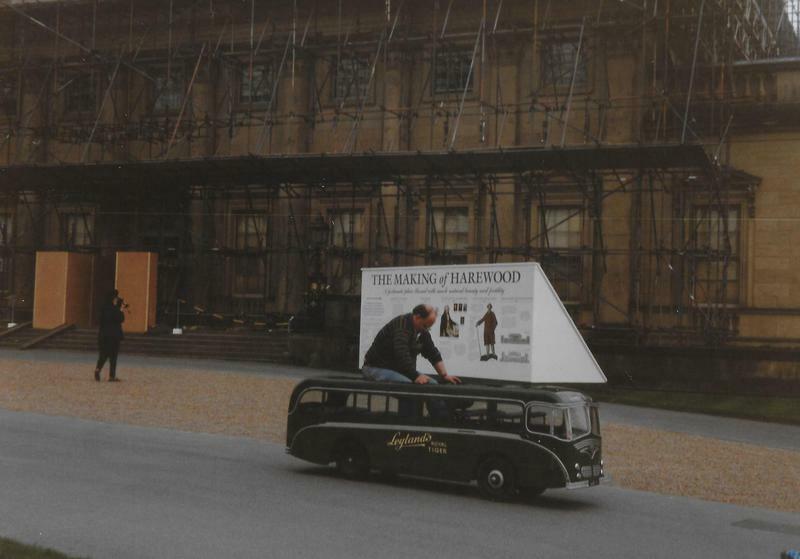 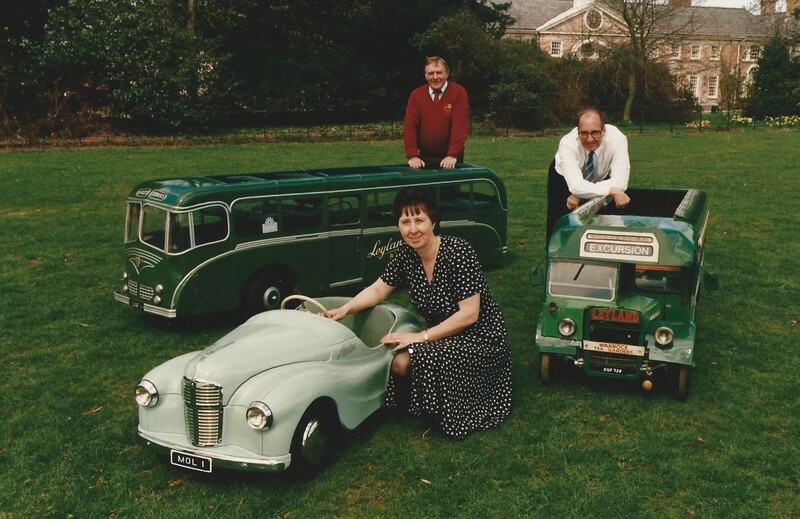 In 1937 he built more of these miniatures and they were fitted with Villiers 125cc engines and seated a driver and four children. 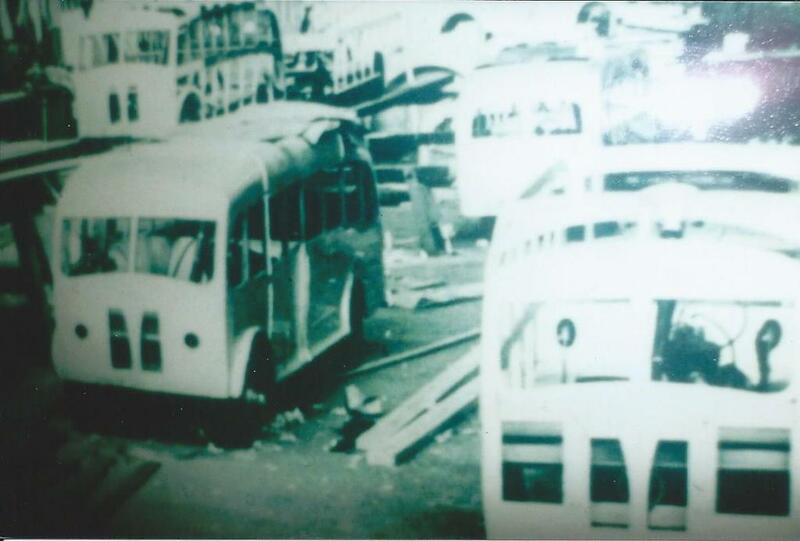 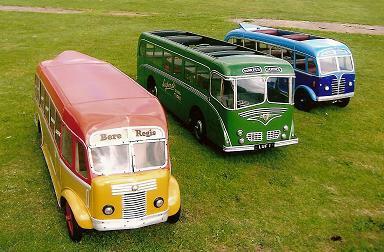 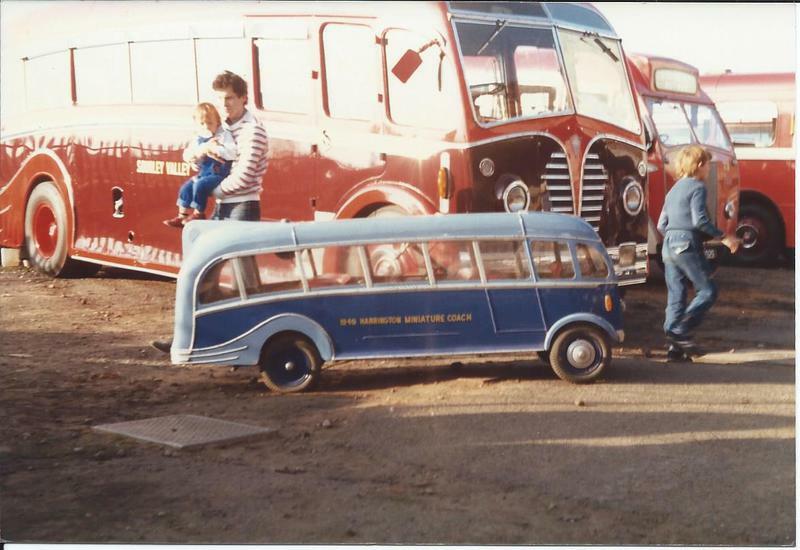 Over the next 22 years a total of 63 were produced including a double decker and three fire engines. 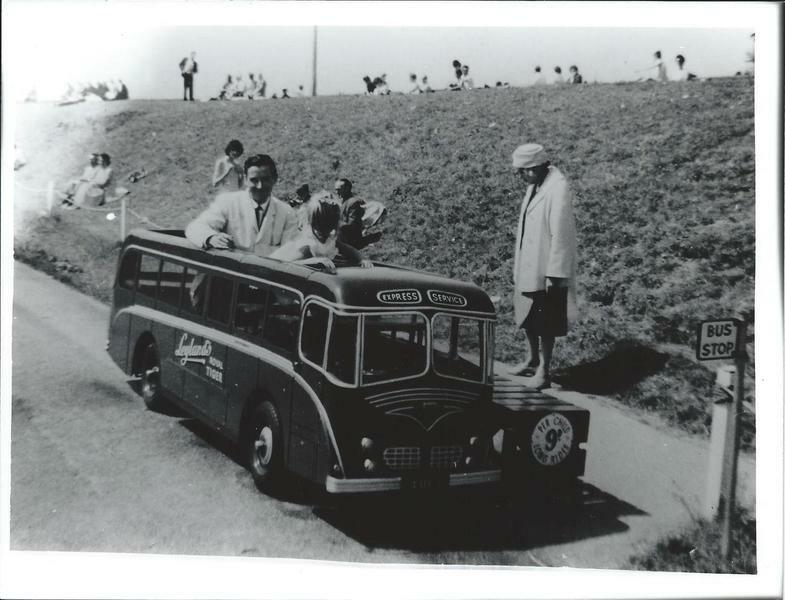 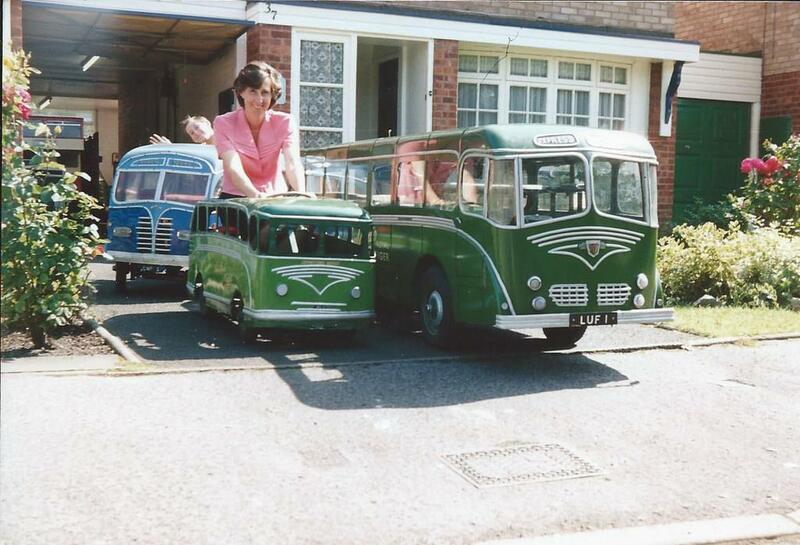 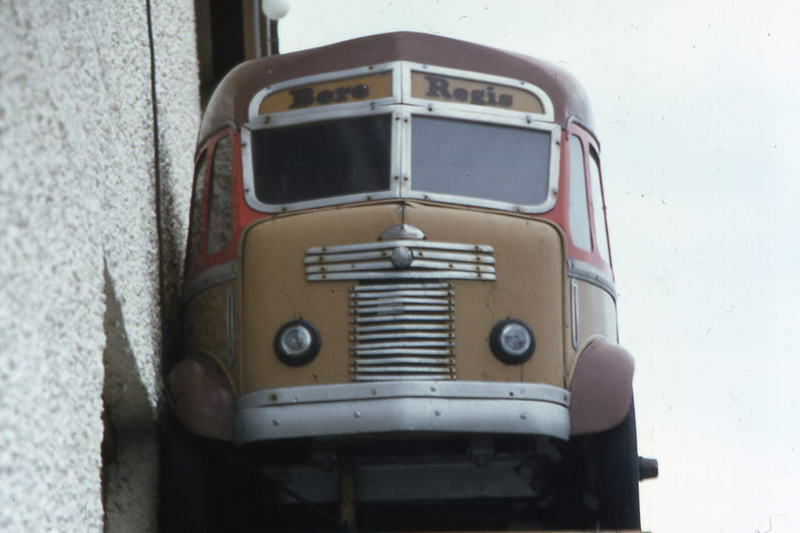 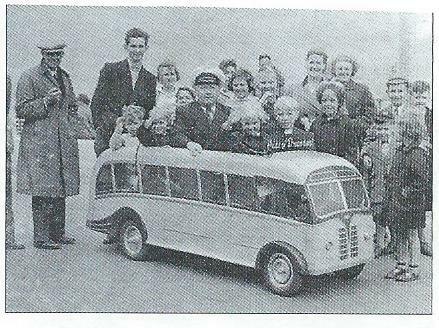 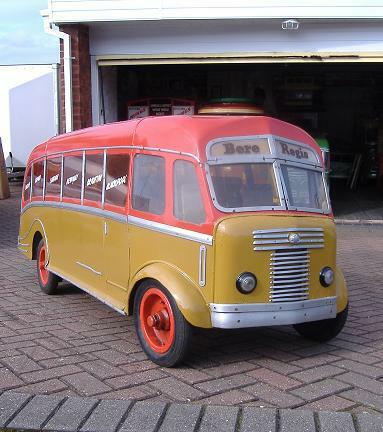 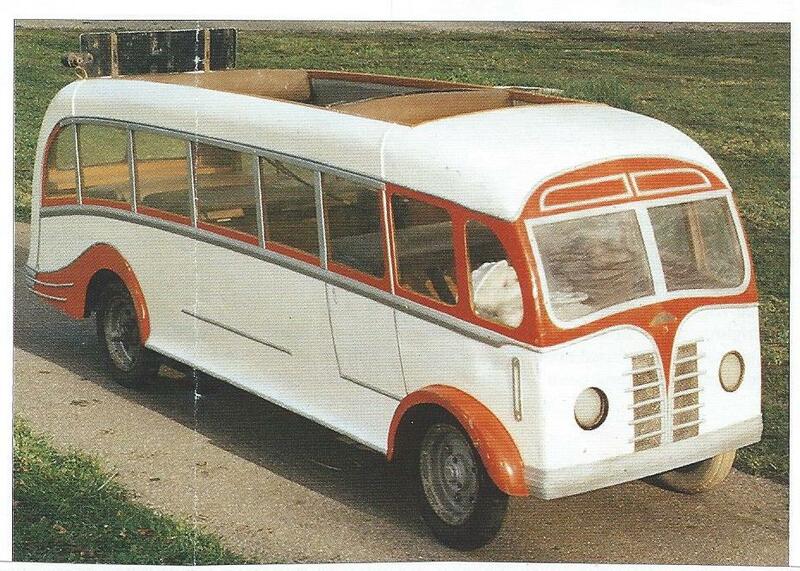 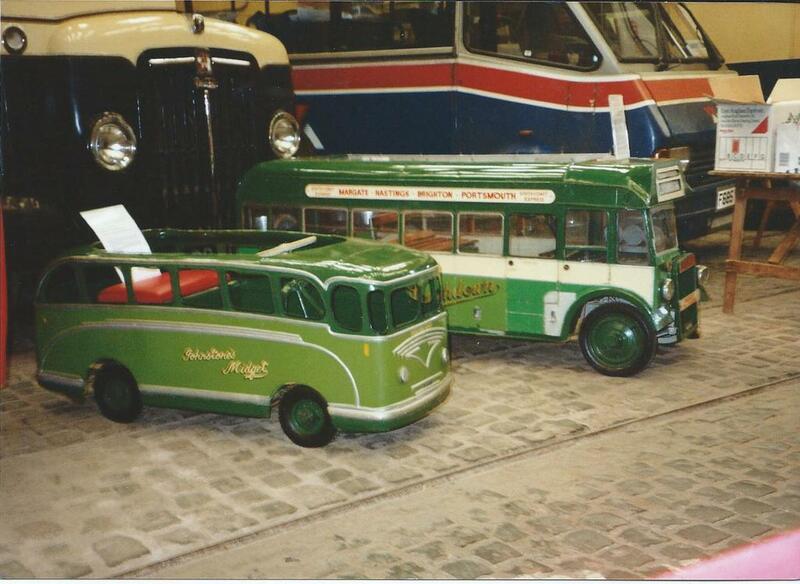 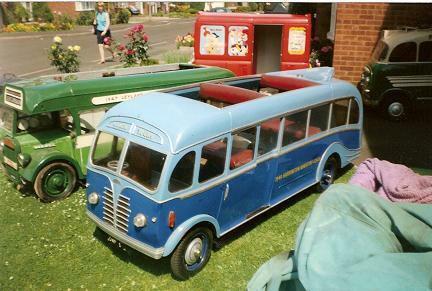 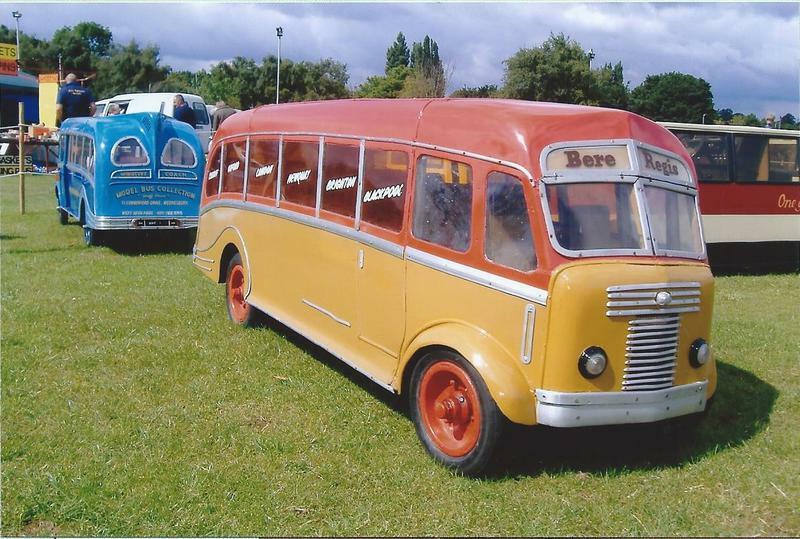 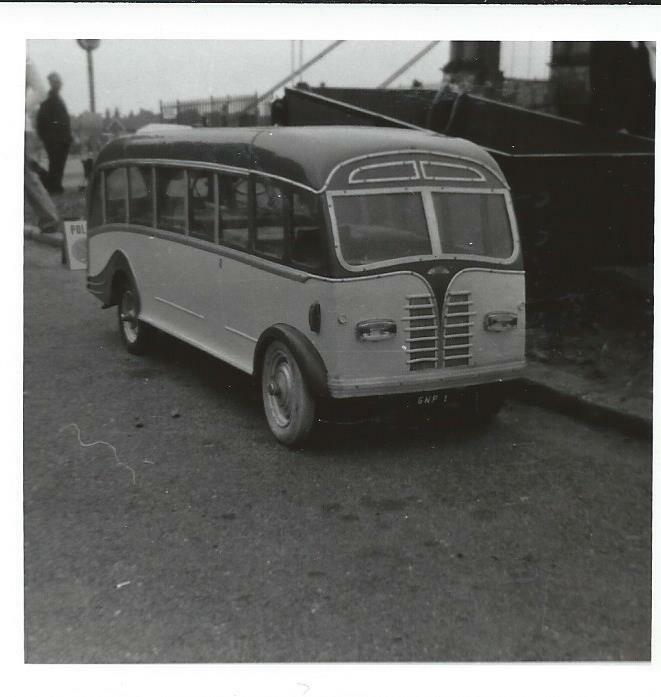 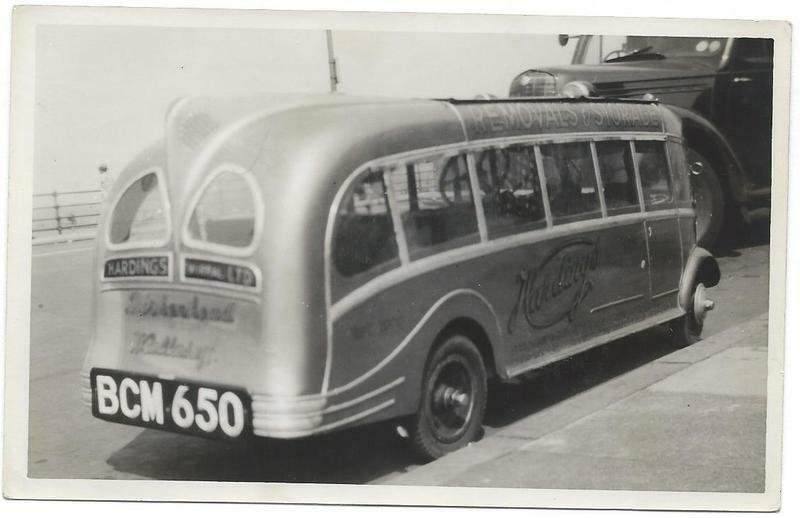 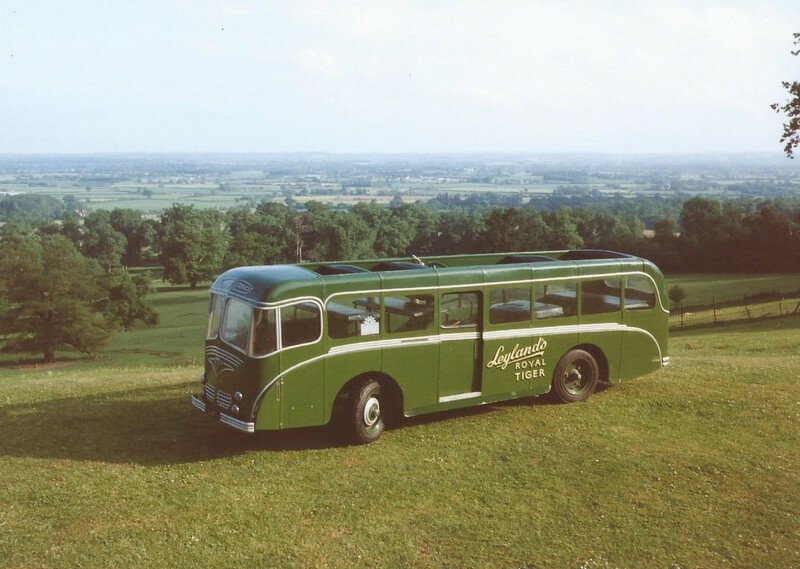 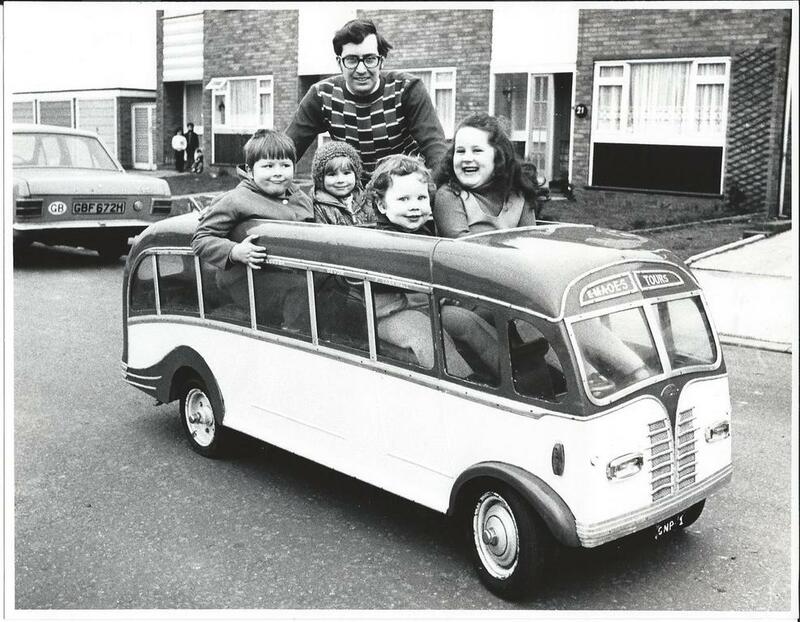 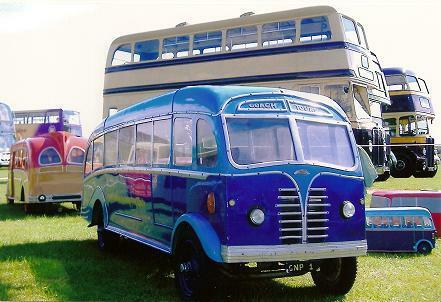 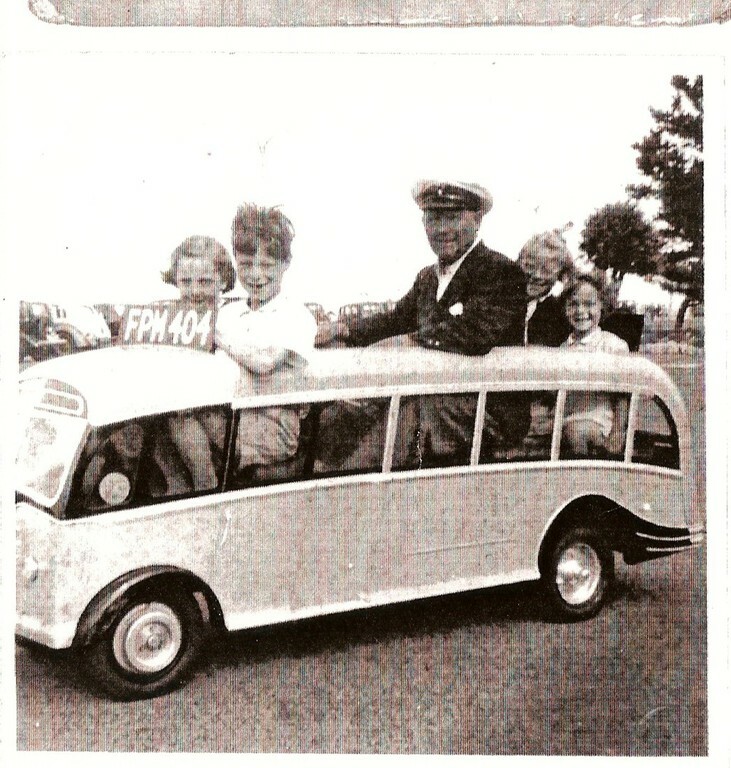 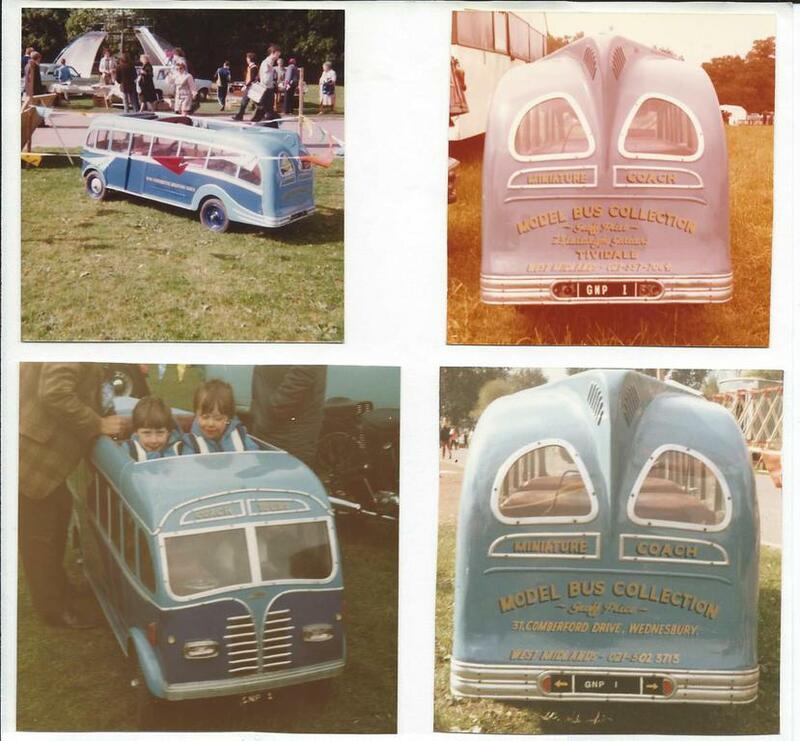 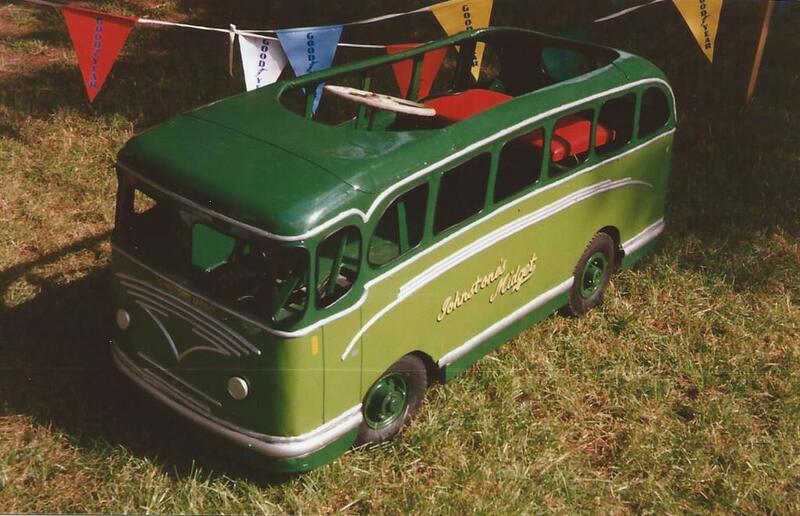 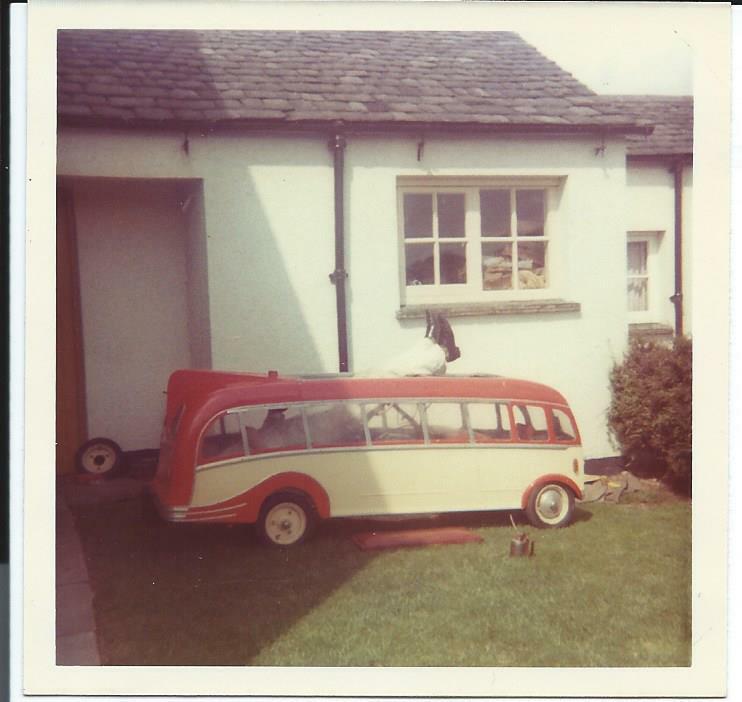 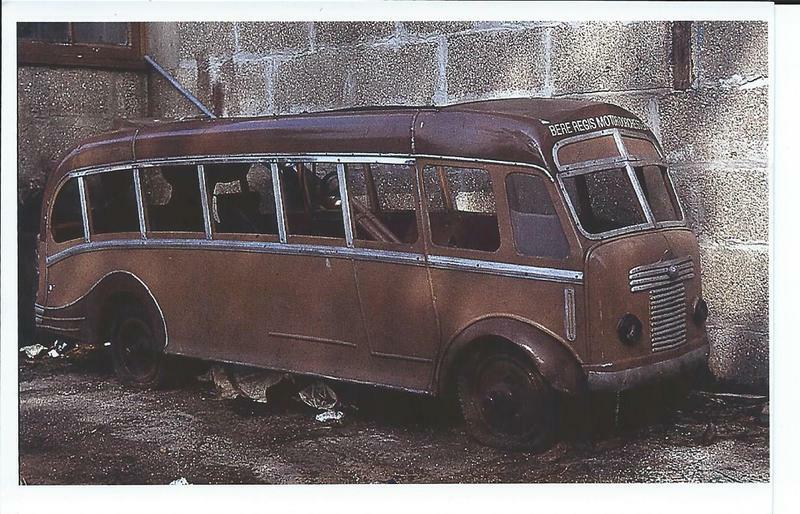 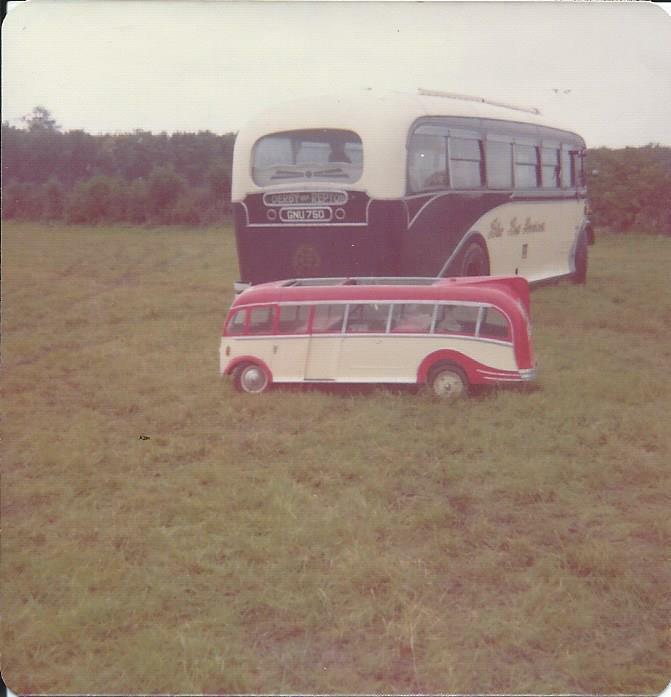 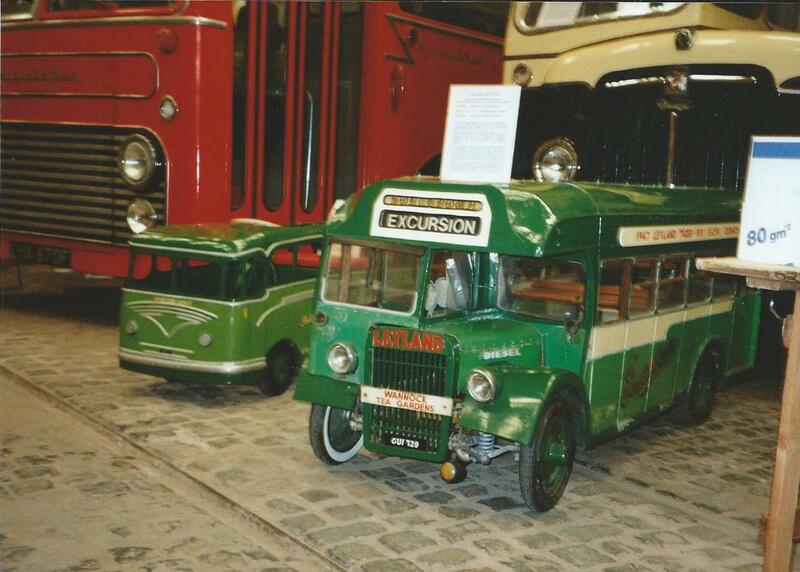 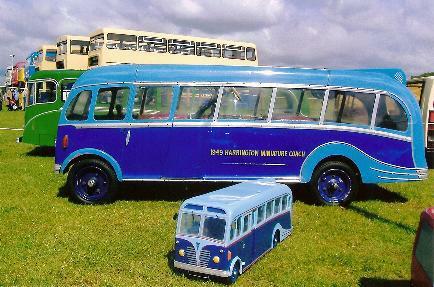 In early 1949 local coach builder Harringtons produced six models on Johnstone chassis and later that year acquired another eight chassis and produced four Harrington Coaches with AEC Regal III bodies with their famous dorsal fin design seating two children and four without the fin seating four children. 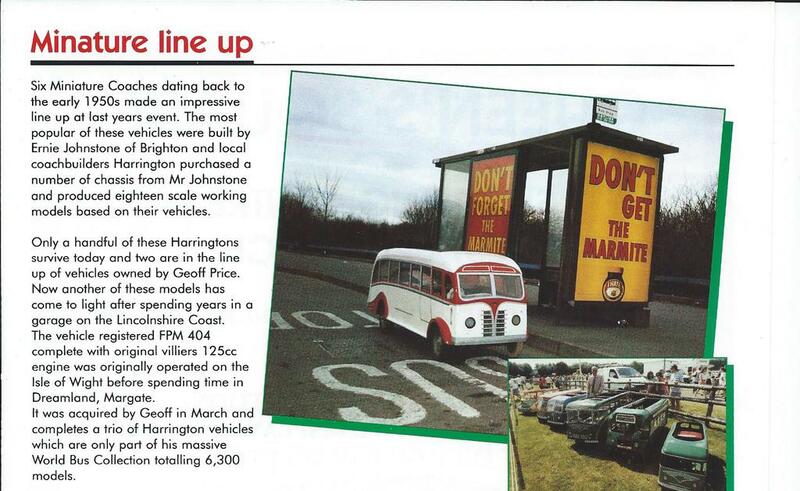 Harringtons were involved when Ernie Johnstone received a large order in 1950. 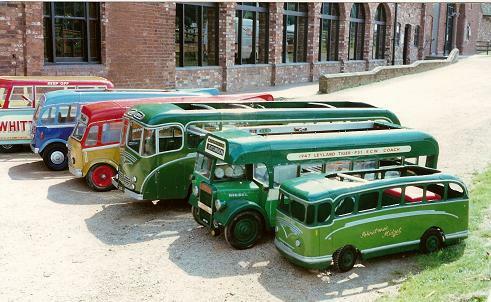 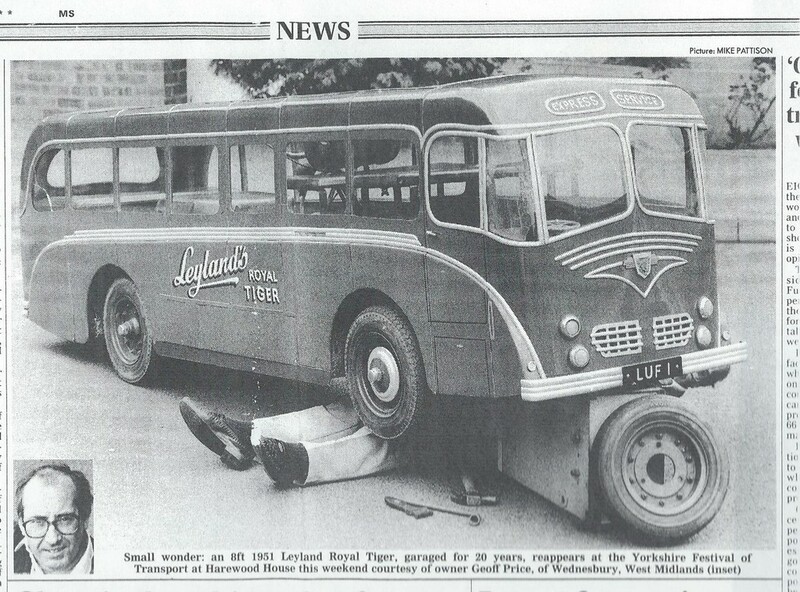 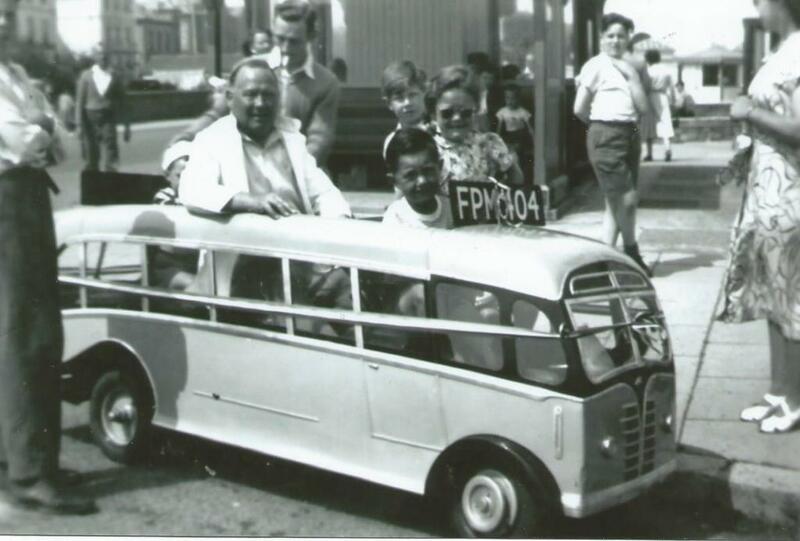 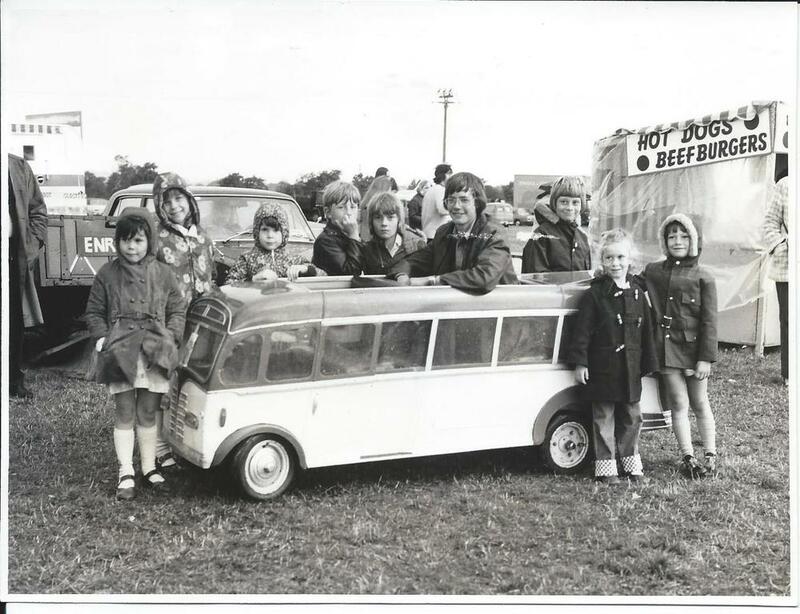 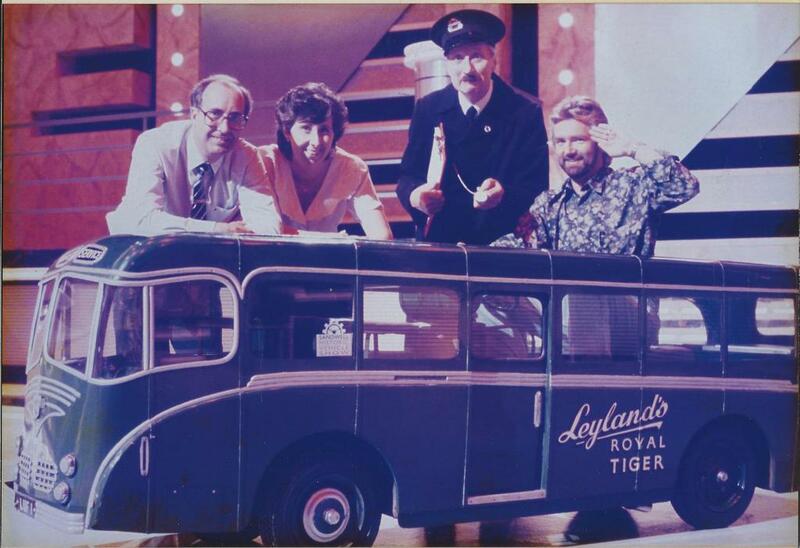 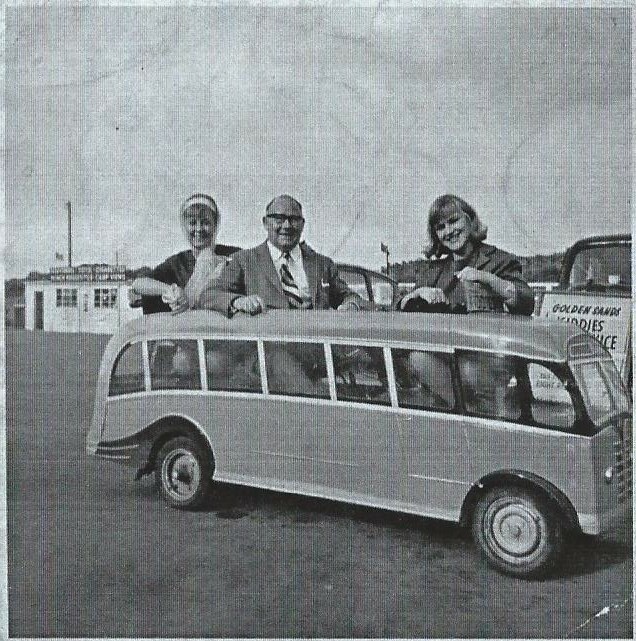 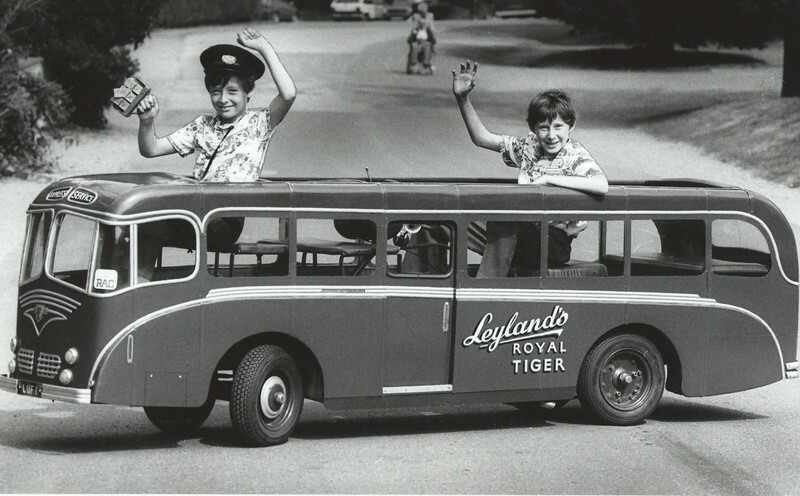 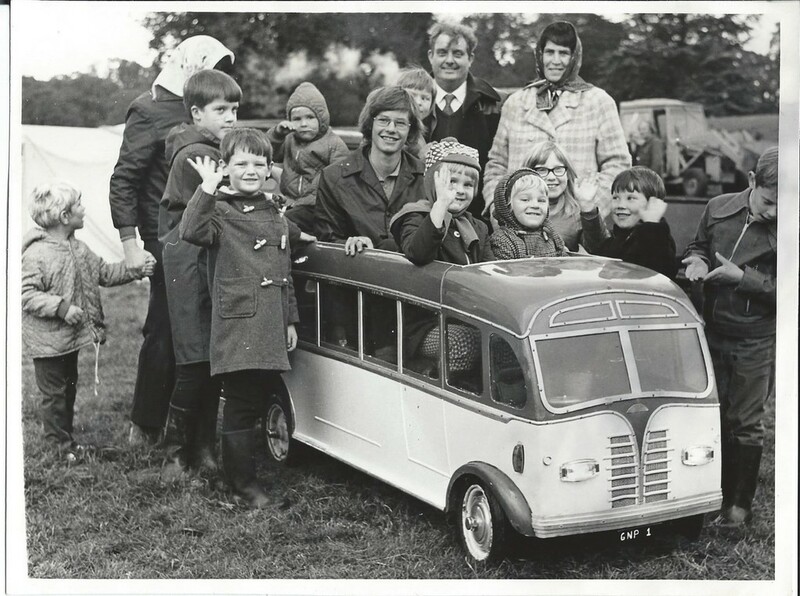 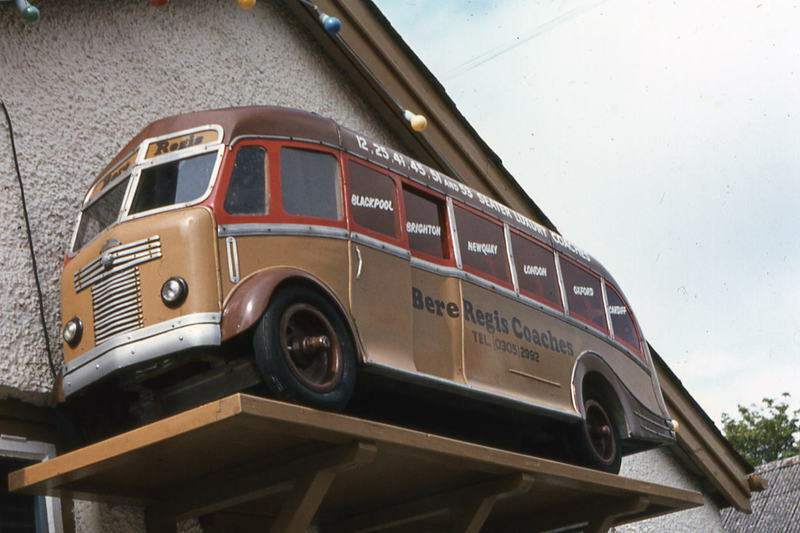 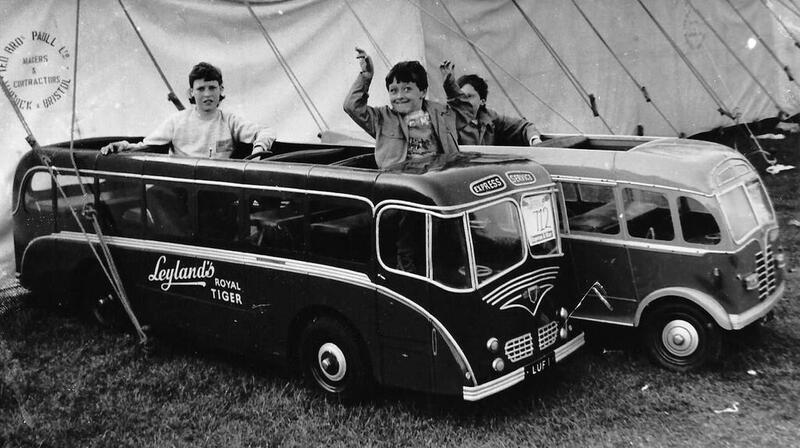 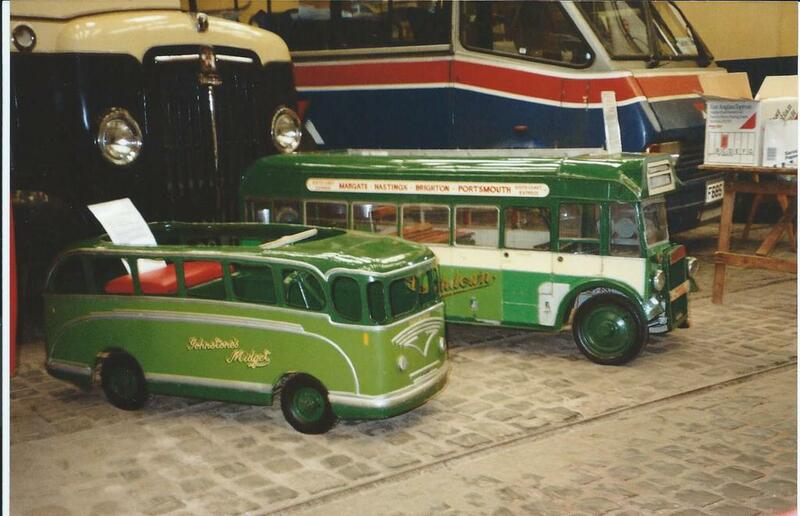 The final six models built in 1958 were self-drive Leyland Royal Tigers with 70cc engines and used on his Peter Pan Fairground until December 1960 when Johnstone’s midgets finished. 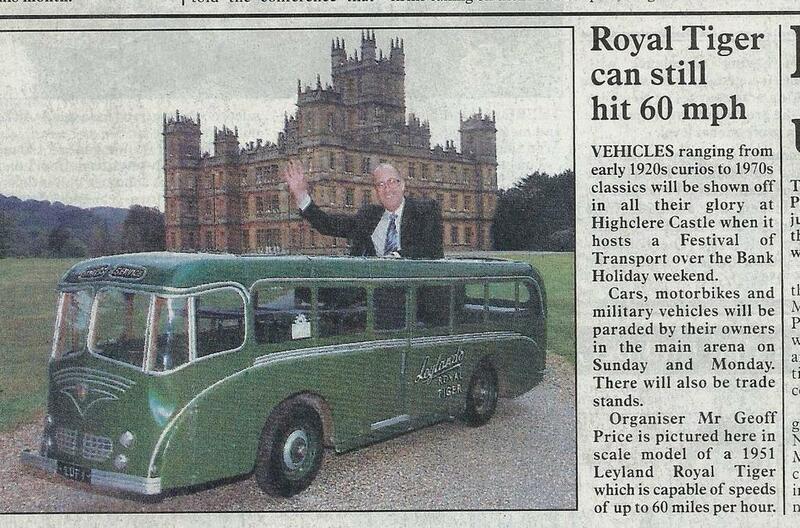 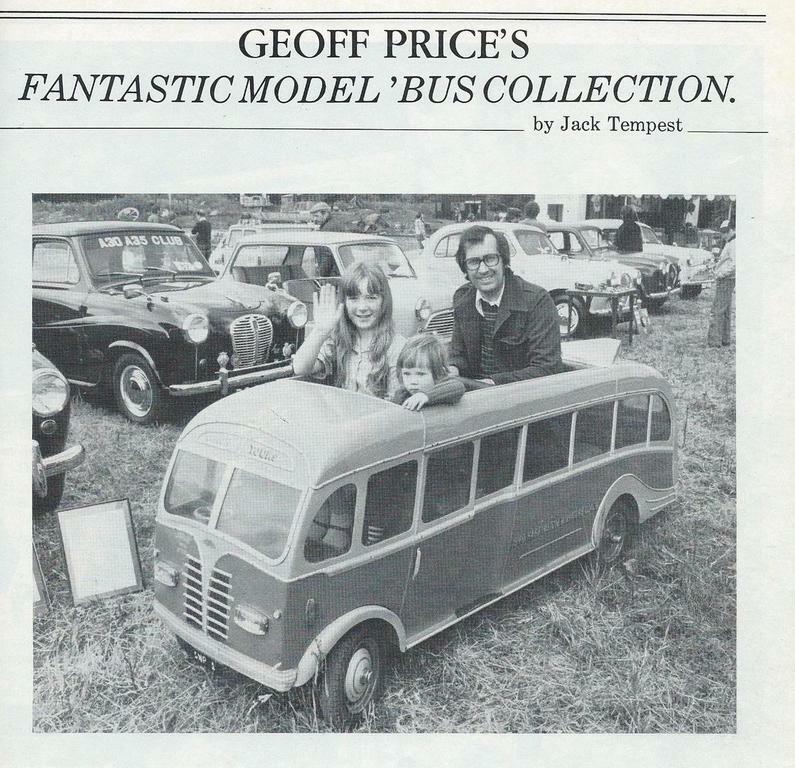 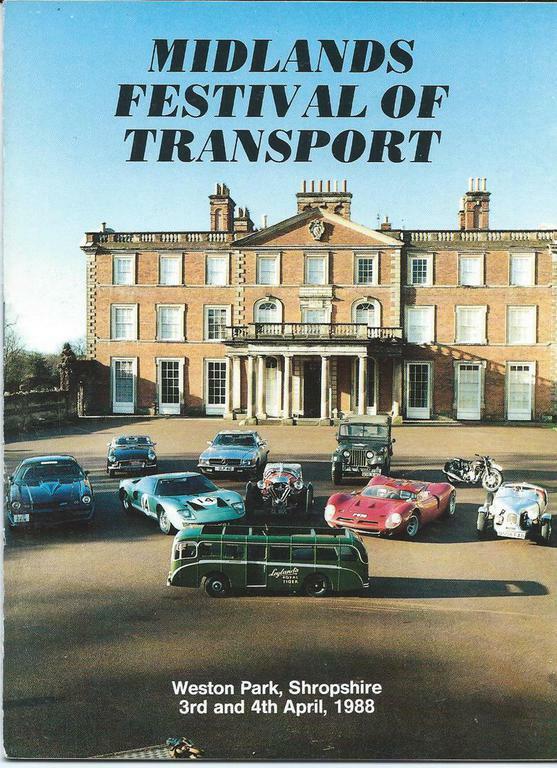 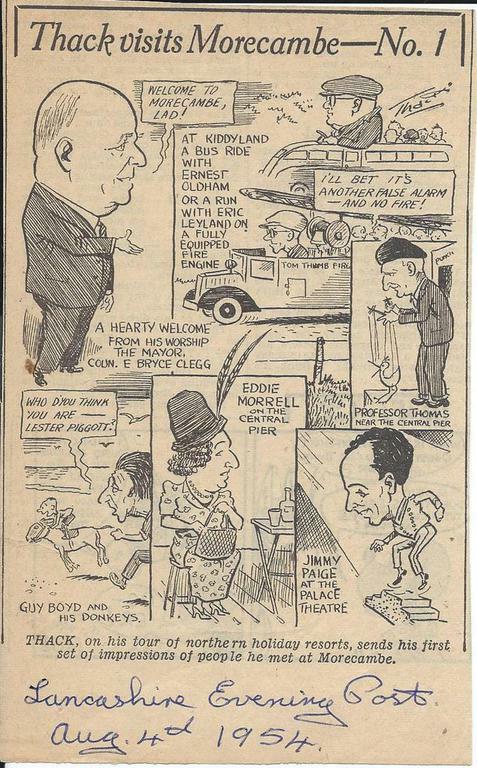 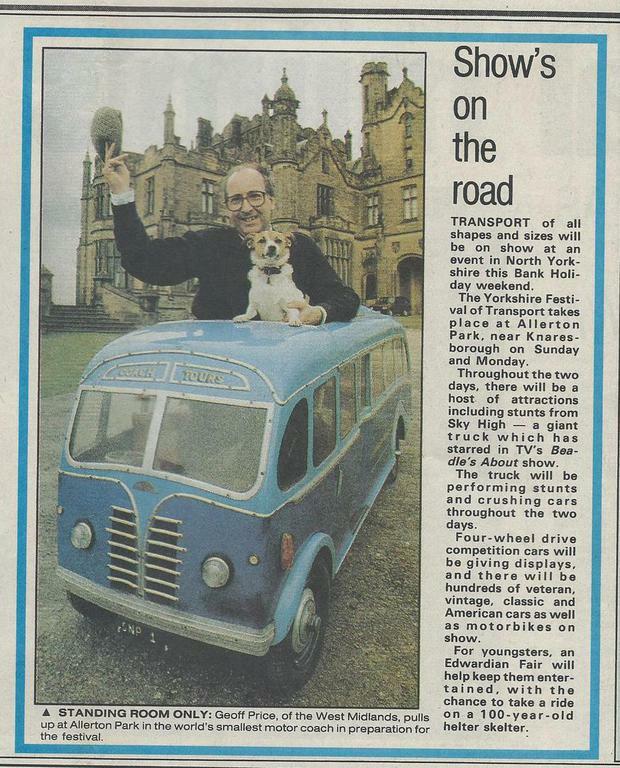 Footnote: Geoff has been involved and written a number of articles over the years on these fascinating vehicles. 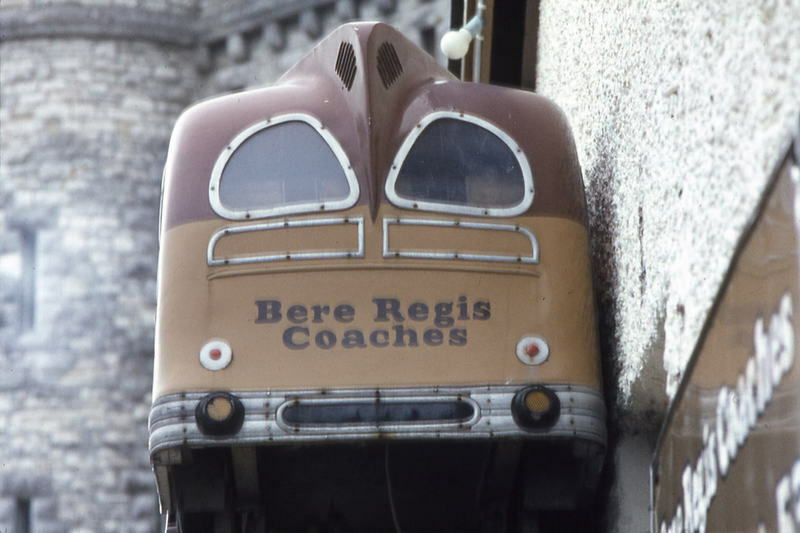 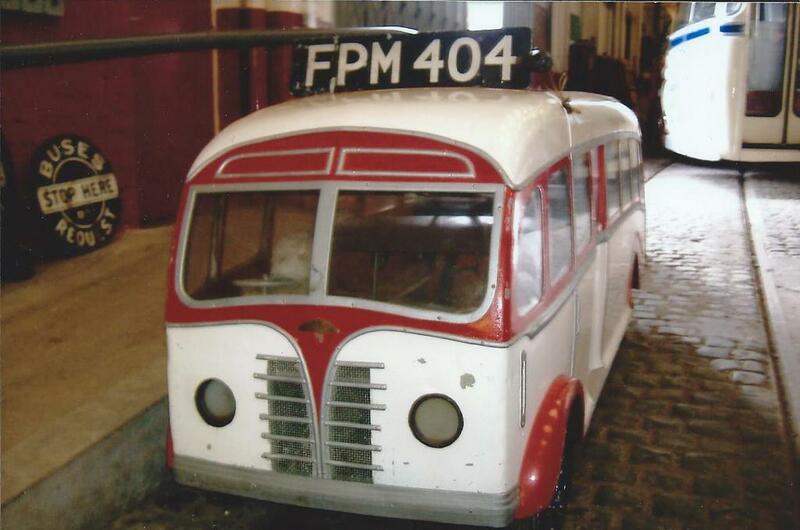 It is believed 21 coaches plus two fire engines (one in the USA) still survive today. 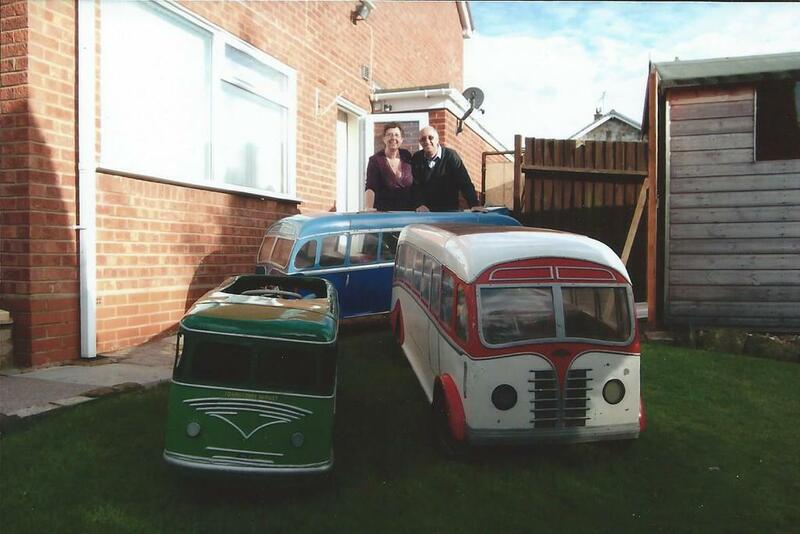 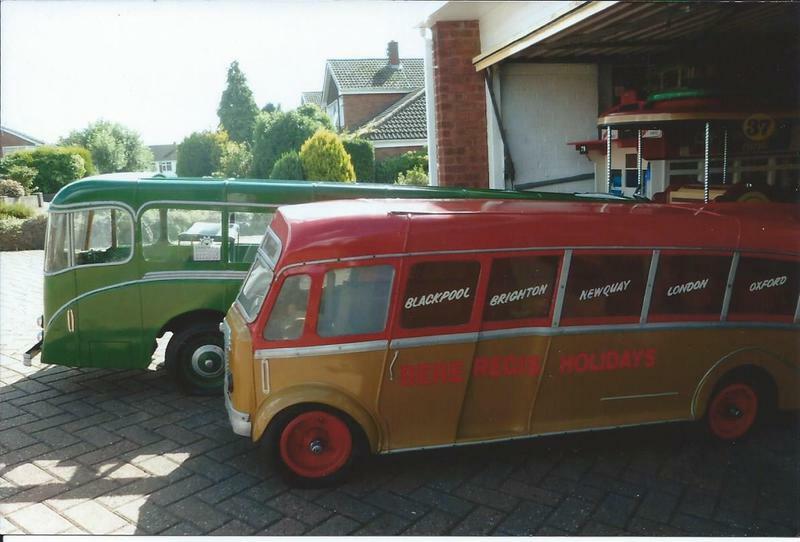 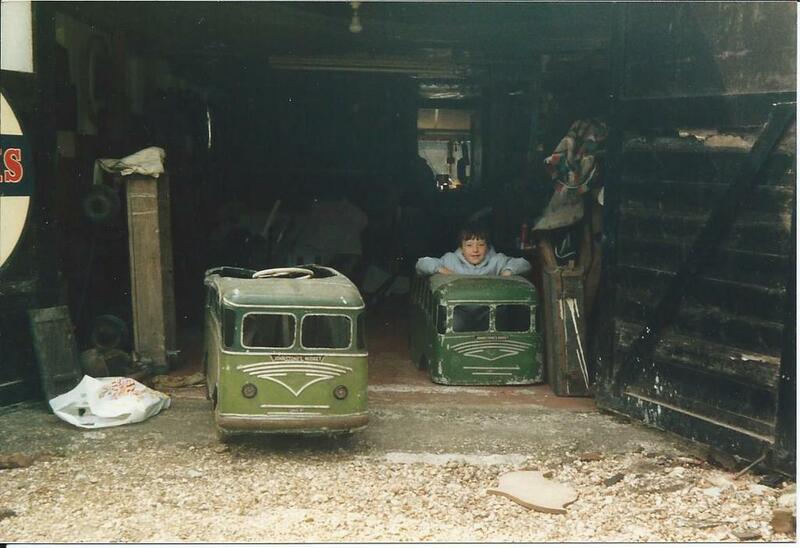 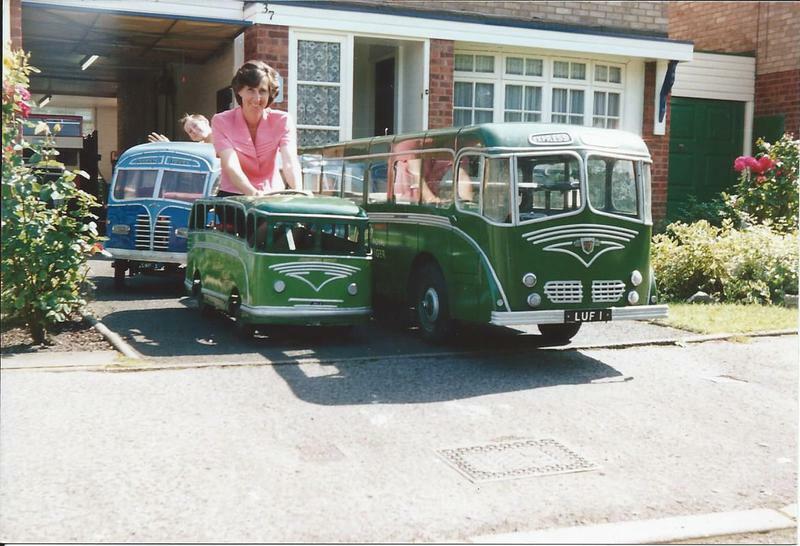 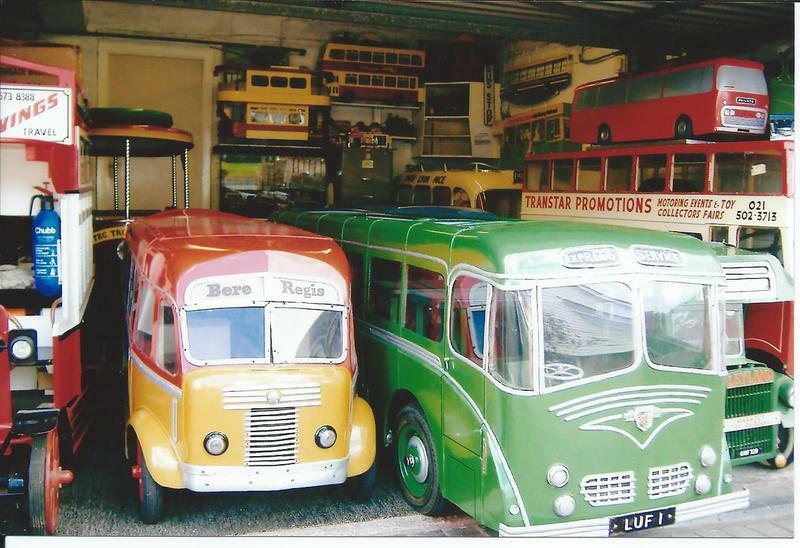 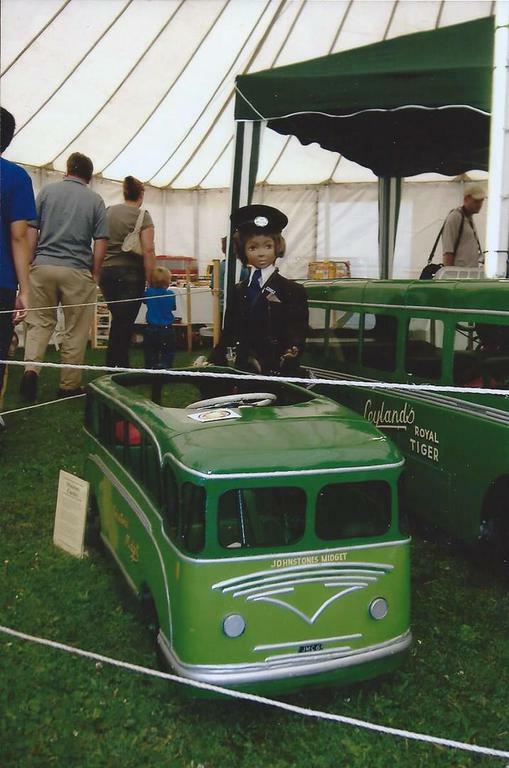 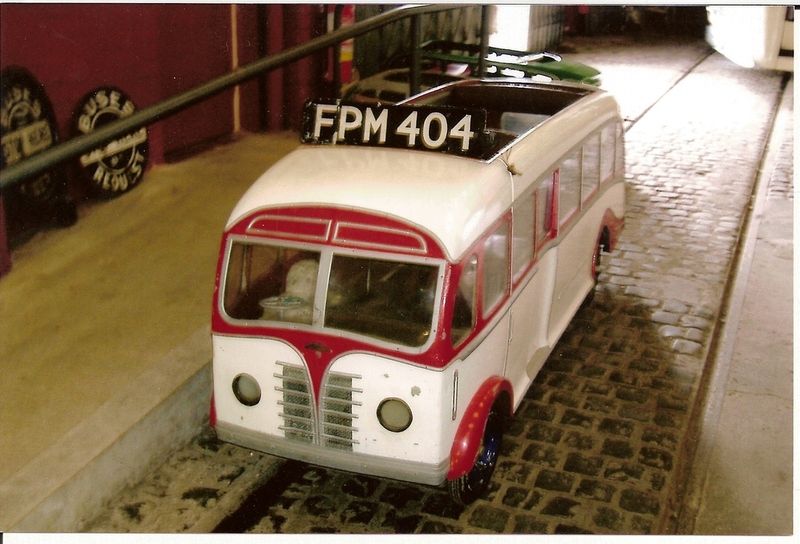 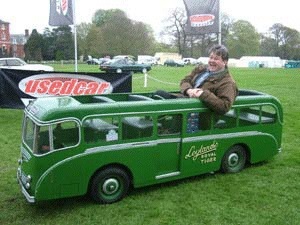 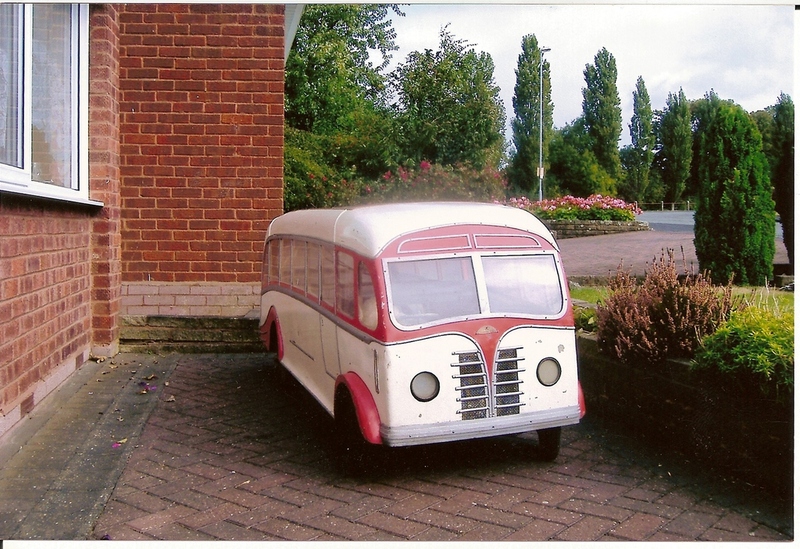 Geoff and Linda have six of these Johnstone – Harrington models in their collection plus other larger models not associated with Johnstone Midgets. 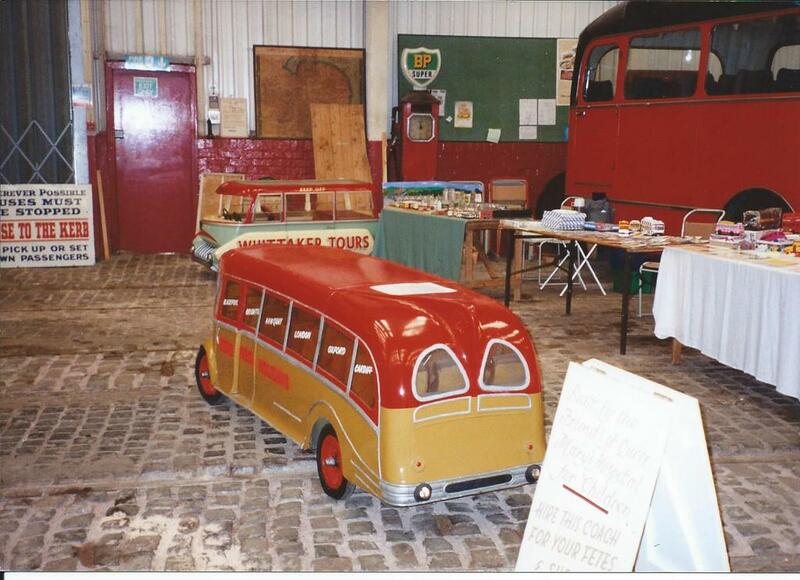 A few pictures of our miniature coaches below. 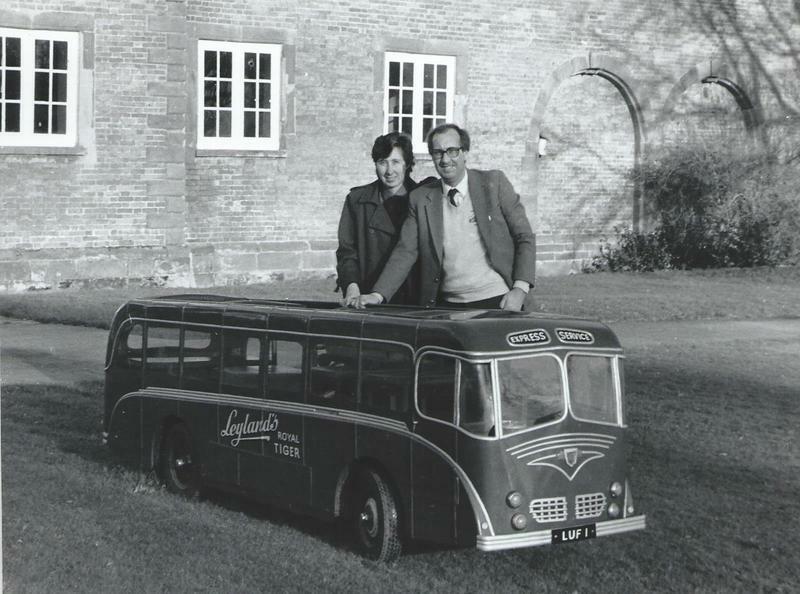 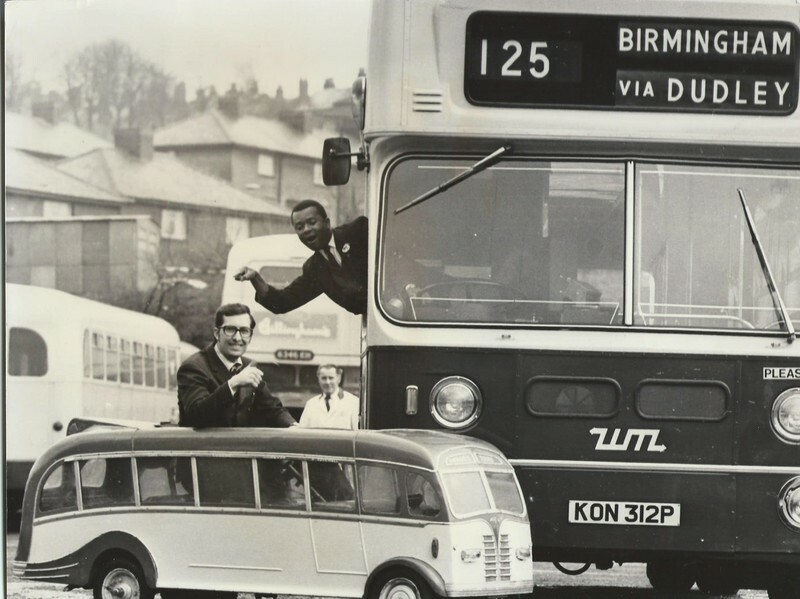 Anyone who can help with further information/photographs on Johnstone – Harrington Miniature Coaches please email us at: transtar@talk21.com It is hoped to produce a full history in the future containing much of the information we have collected over the past forty years. 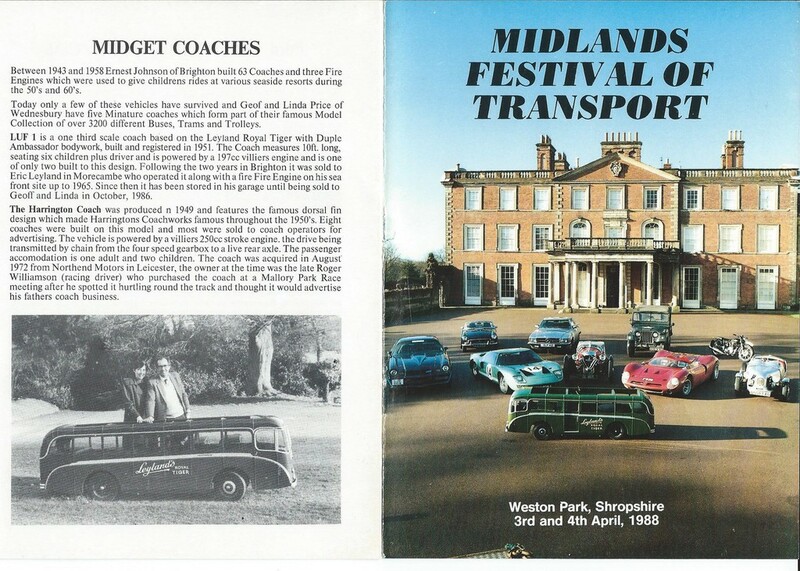 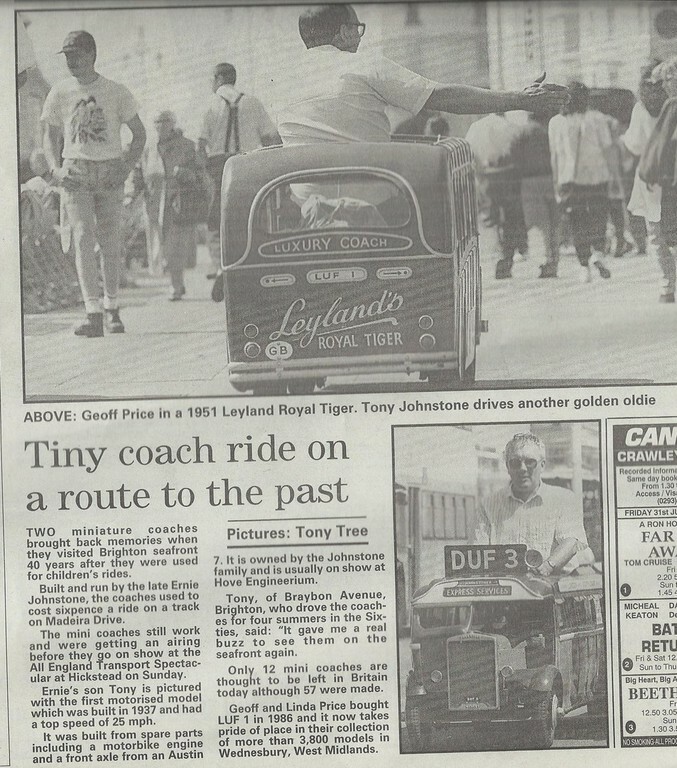 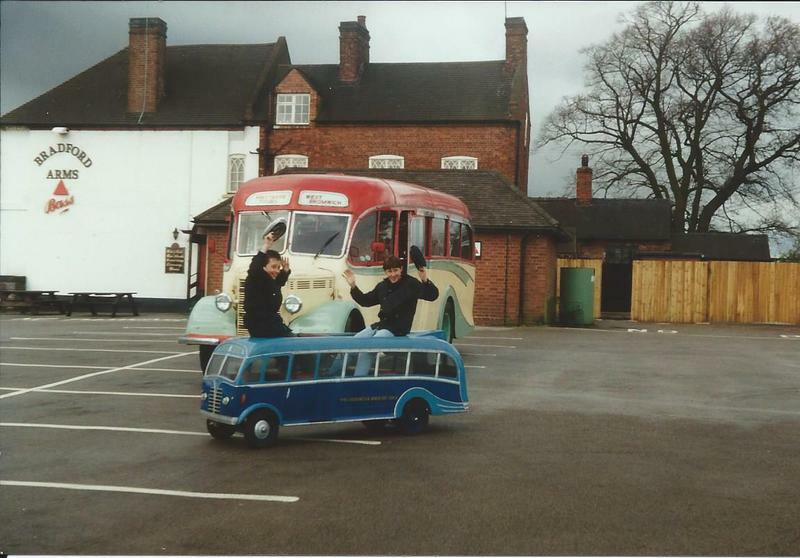 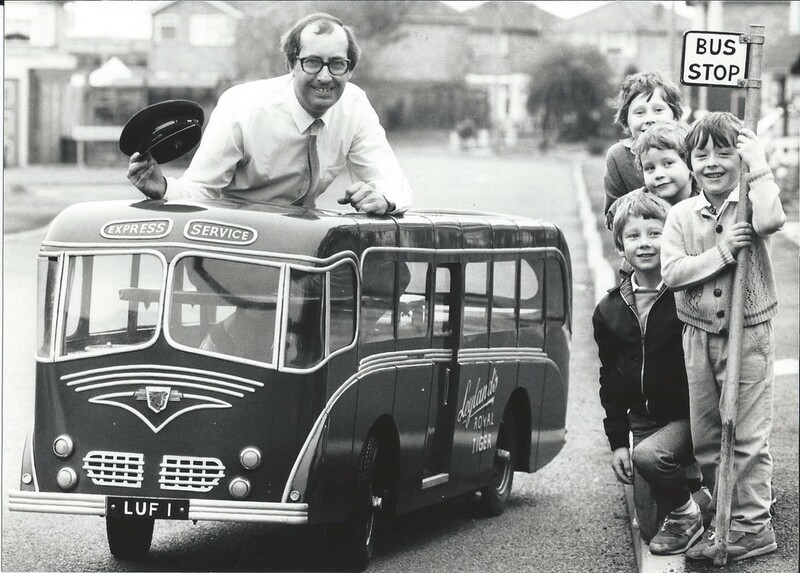 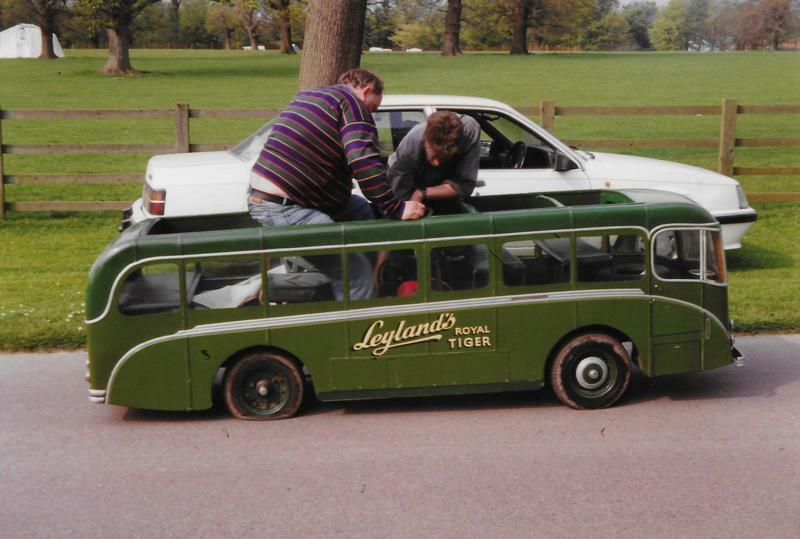 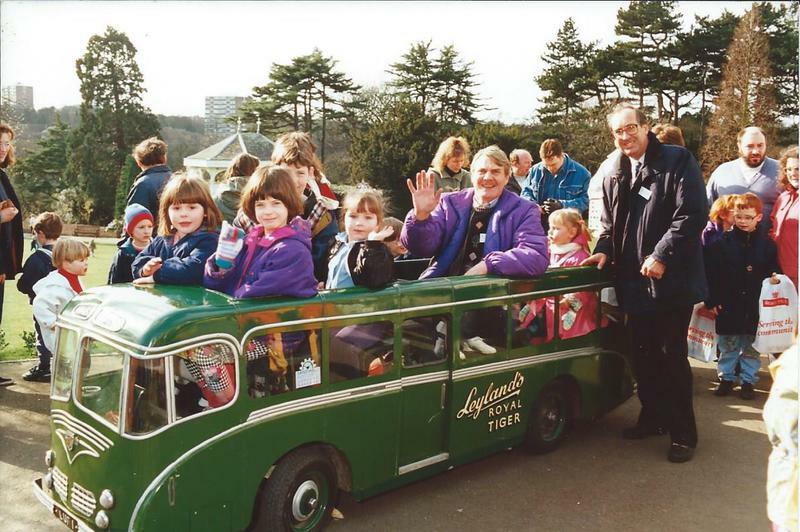 See the Leyland Royal Tiger Miniature Coach photographed at our events 1993-1995 with some of the regular Transtar faces. 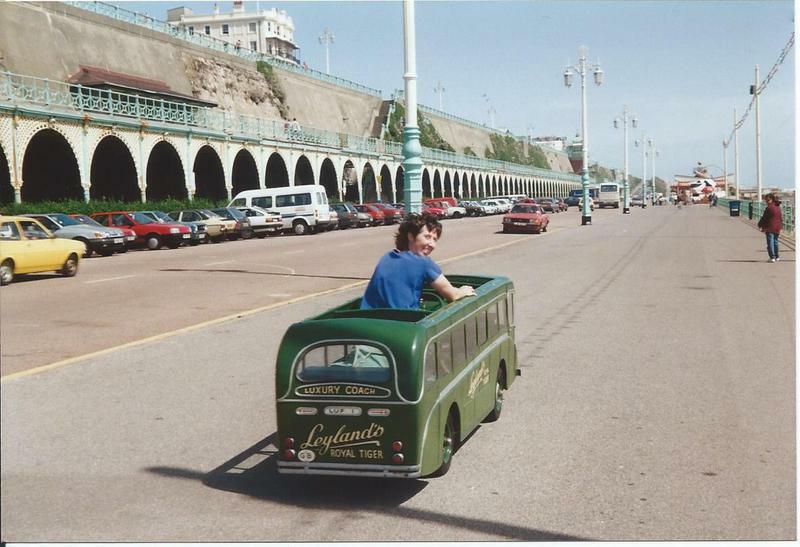 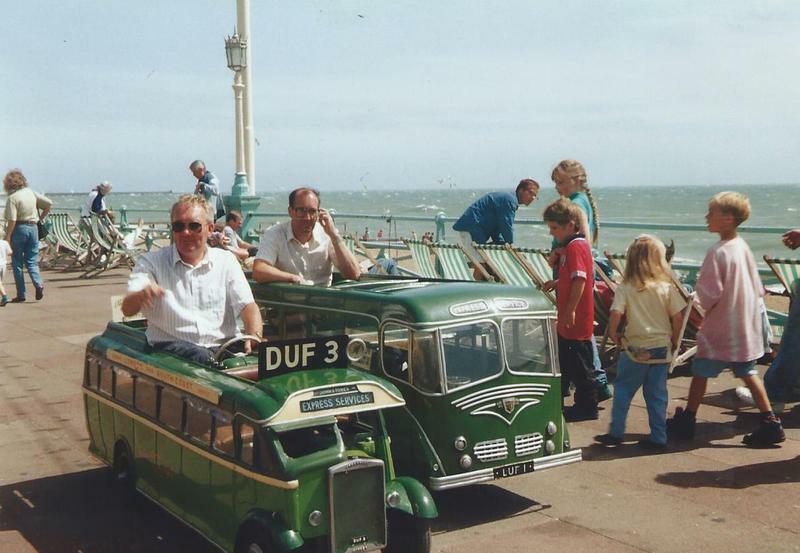 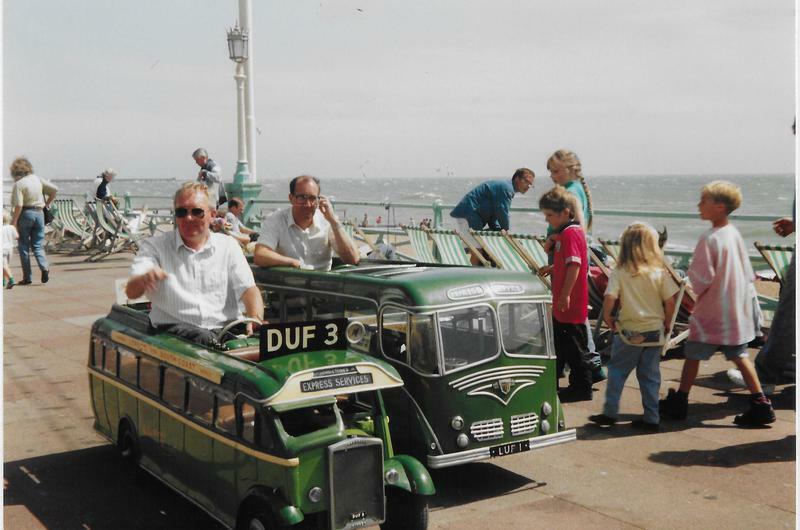 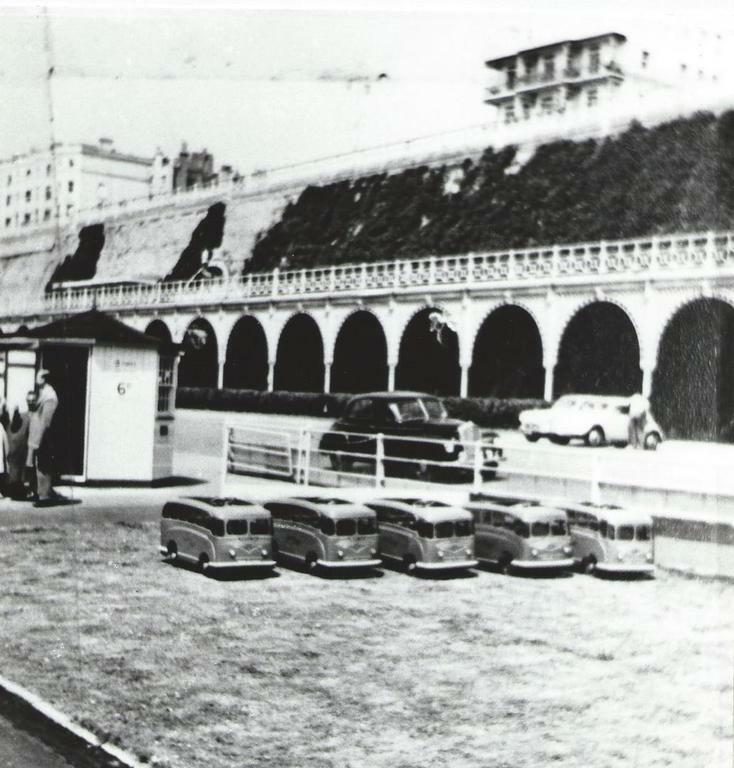 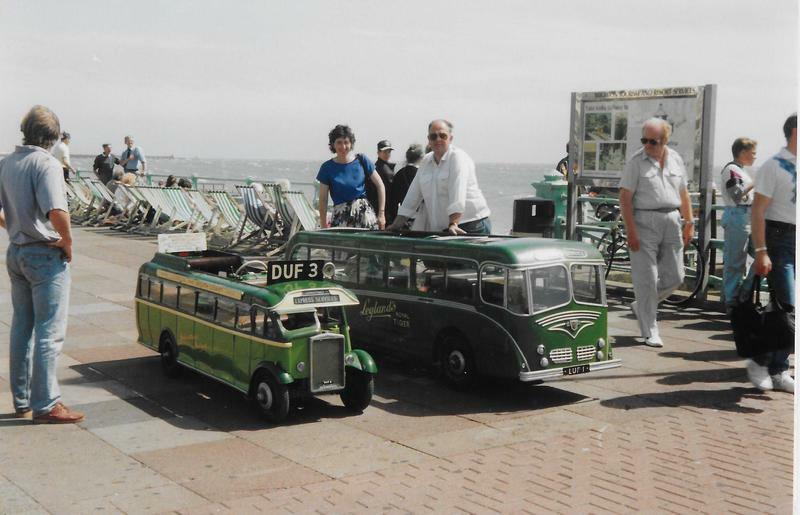 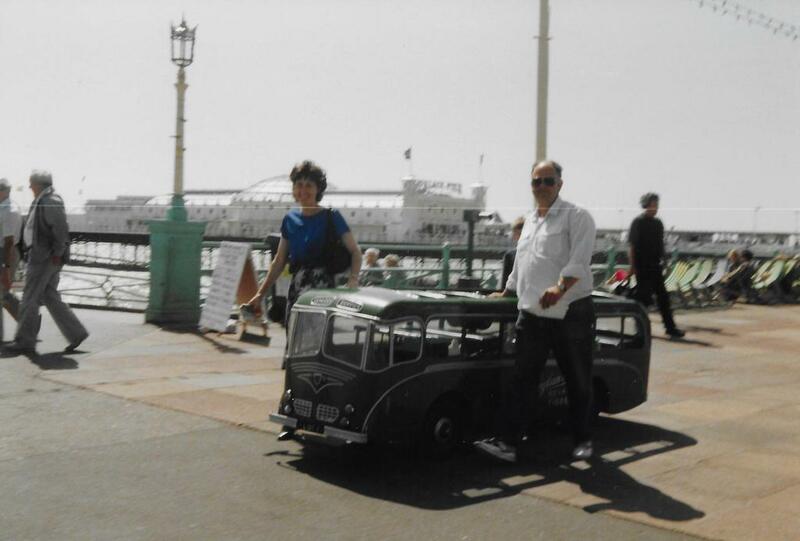 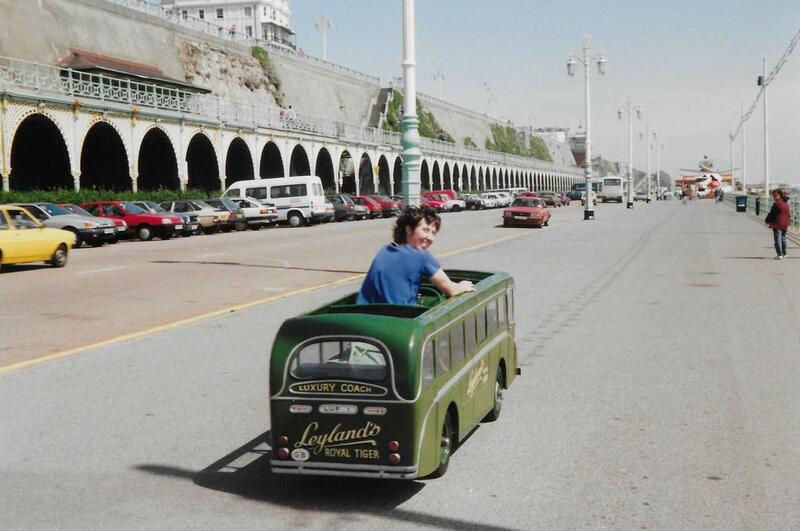 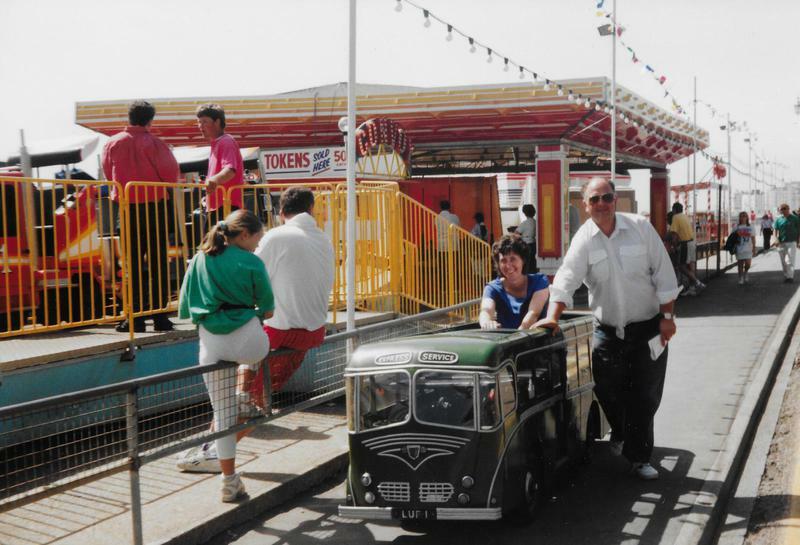 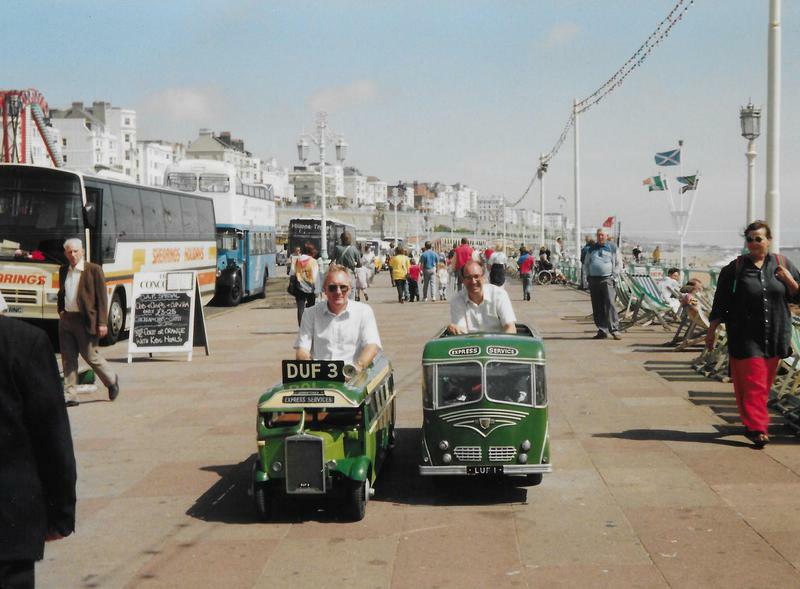 On Brighton Seafront - LUF 1 was driven by current owner (since 11th October 1986) Geoff Price ,from the Peter Pan's Playground site along Brighton Promenade to the Pier in August 1992 and joined up with Tony Johnstone who brought along the First of the motorised Miniature Coaches built by his father Ernie Johnstone. 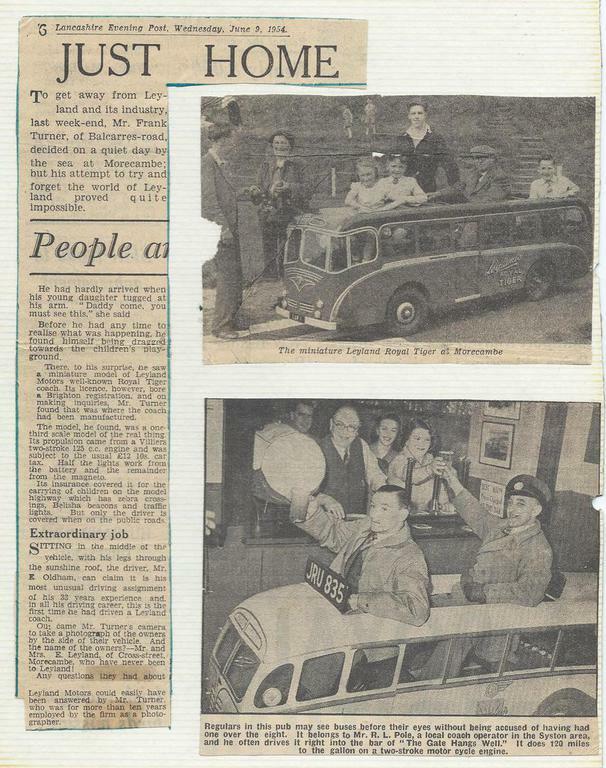 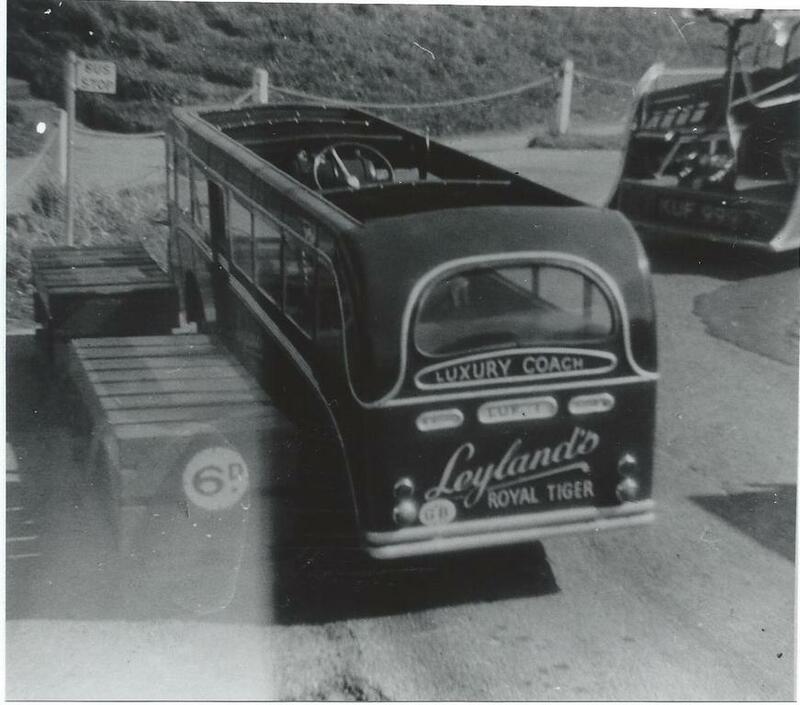 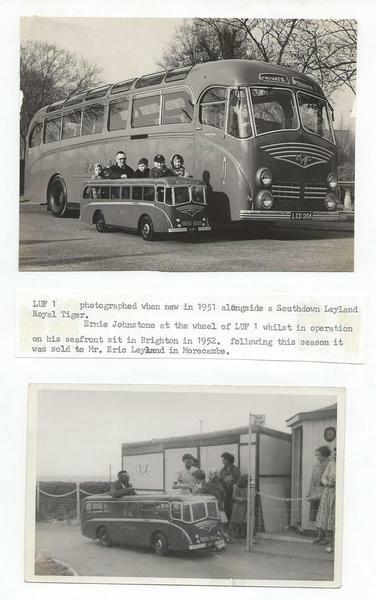 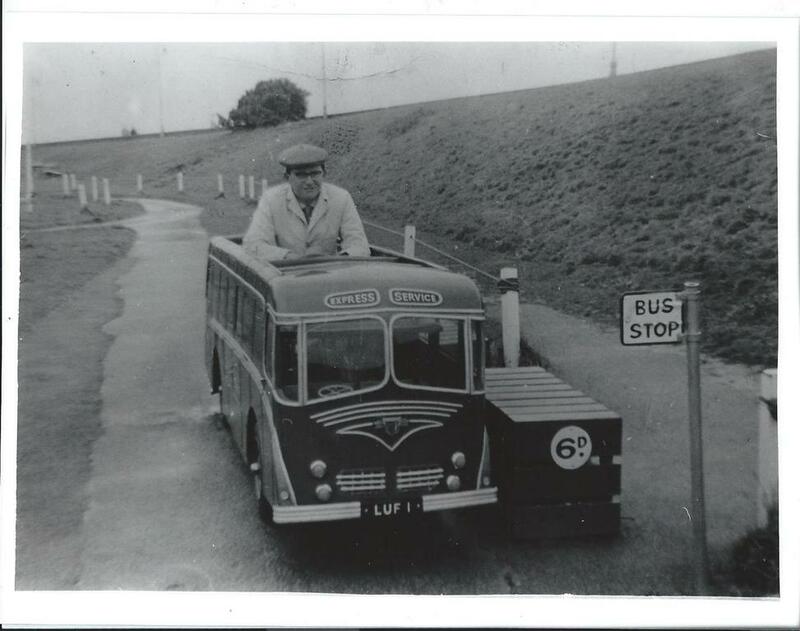 Having recently been sent a link to the Morecambe and Heysham Past and Present site following a picture of our Leyland Royal Tiger Miniature Coach being posted by one of their members who had memories of riding in the coach back in 1957 we joined the group and sent a response to the picture with a potted history of both the Miniature Coach and Fire Engine operated by Eric Leyland on the site behind the super swimming stadium. 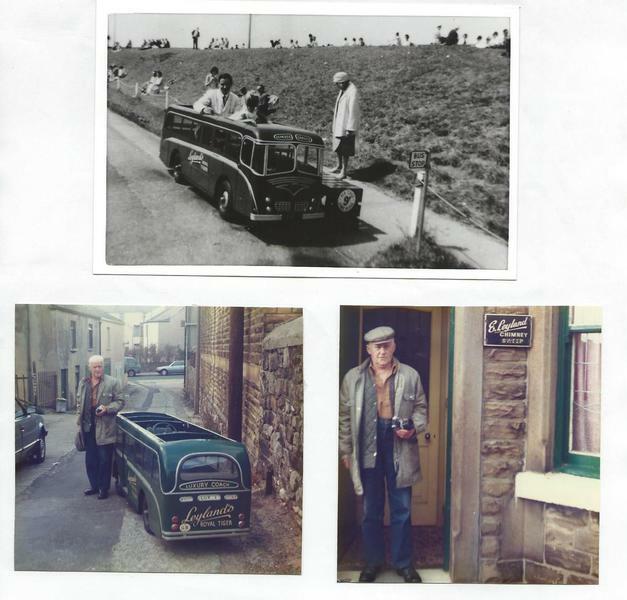 This has resulted in a lot of interest and photographs some of which we share below for those of you who have an interest in the subject and look at our site. 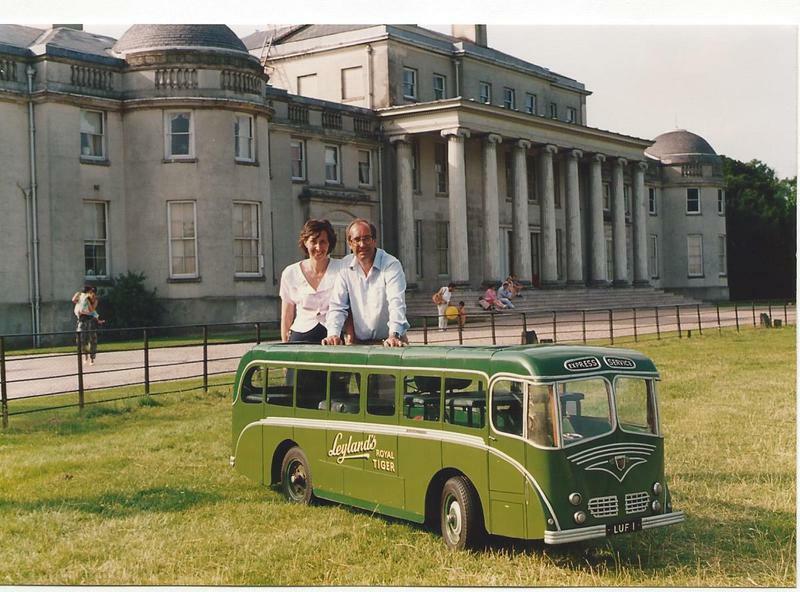 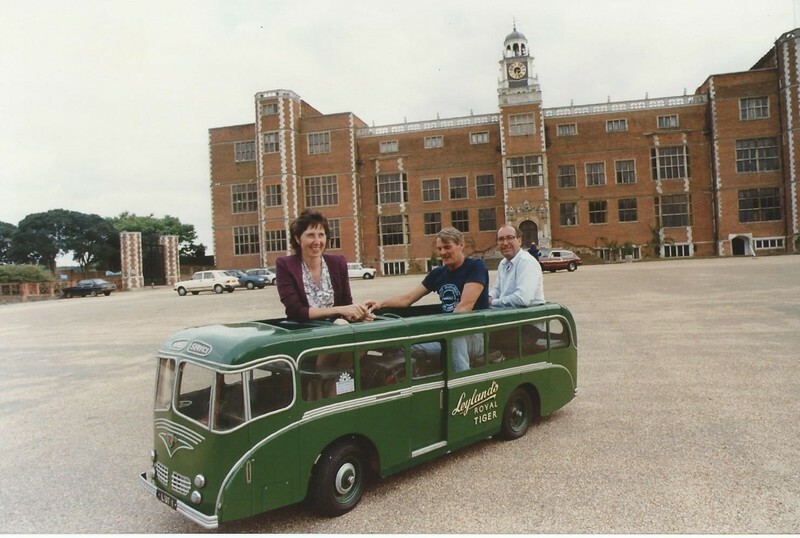 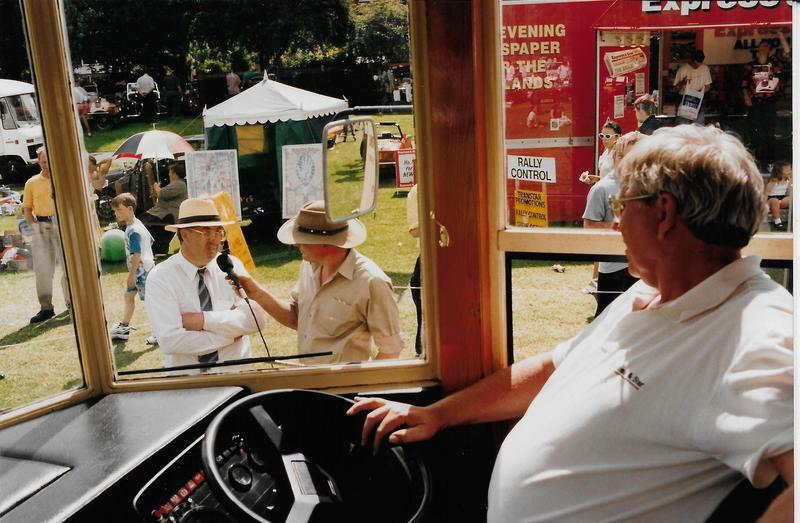 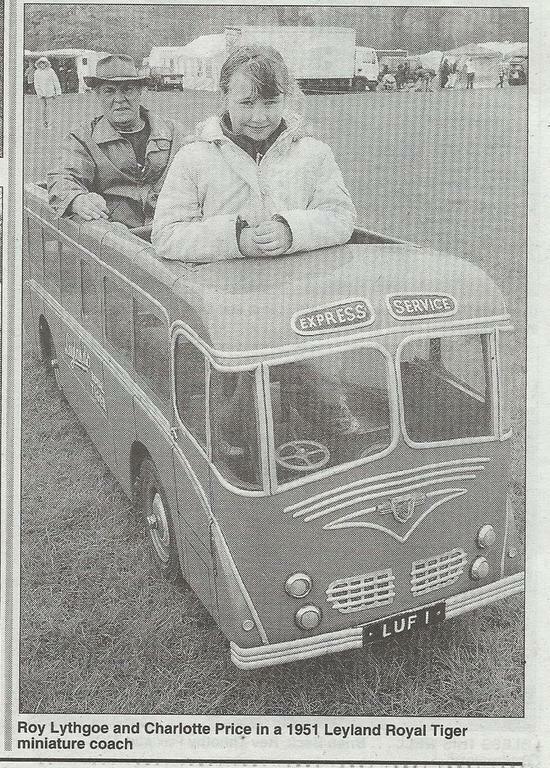 Pictures Above are of Geoff and Linda with LUF 1 - 1951 Leyland Royal Tiger Miniature Coach taken at Hatfield House, Hertfordshire on 2nd August 1992 on the occasion of their first Transport Spectacular at this venue. 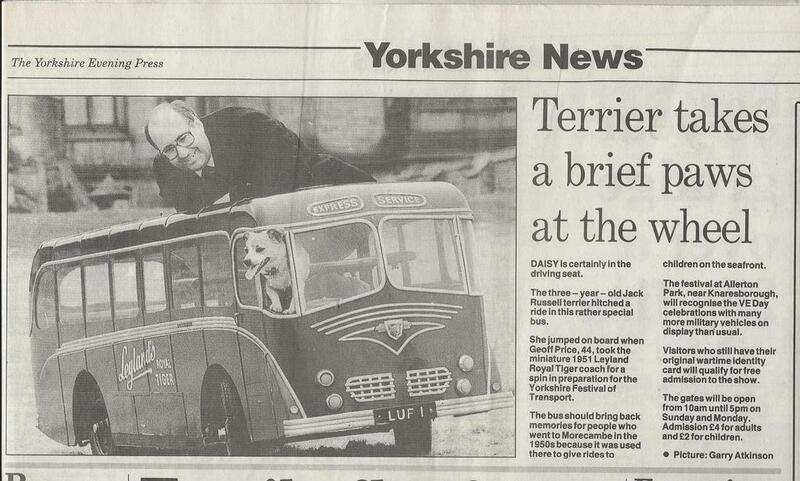 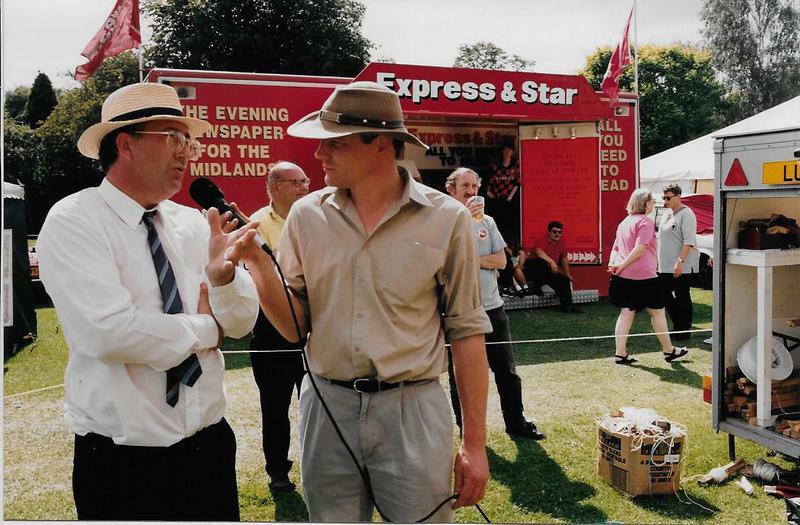 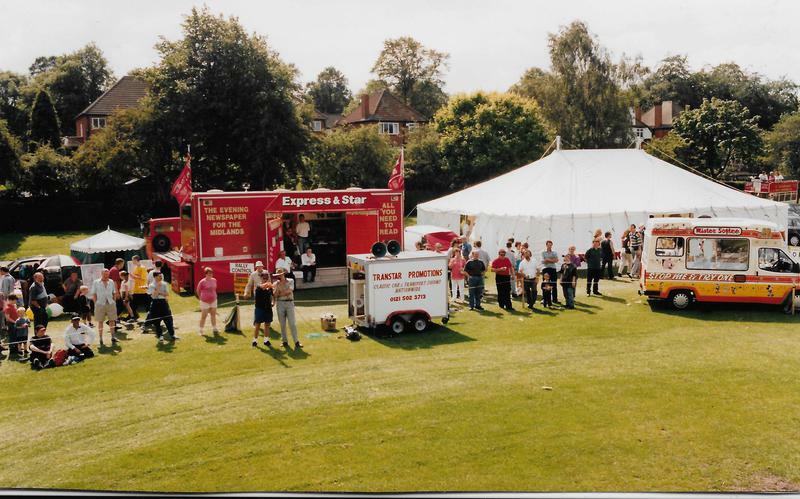 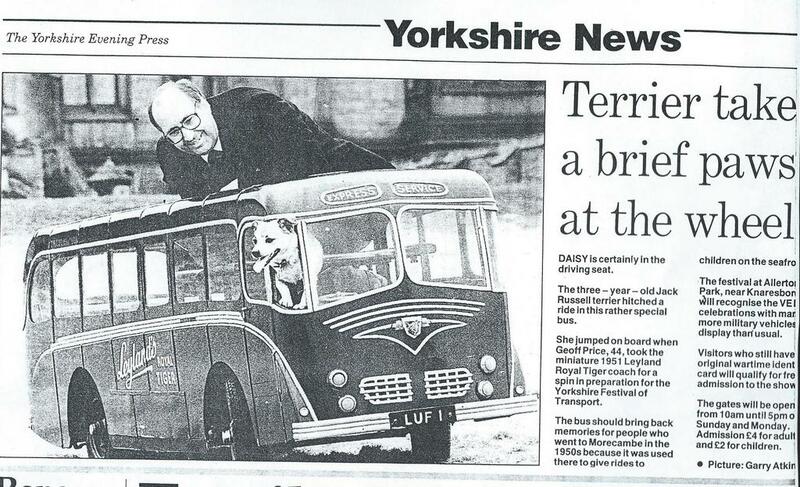 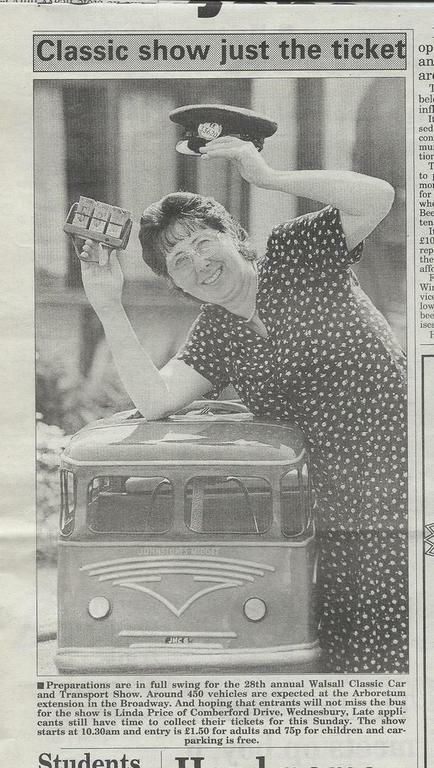 Memories from 24 years ago - the event ran for five years.